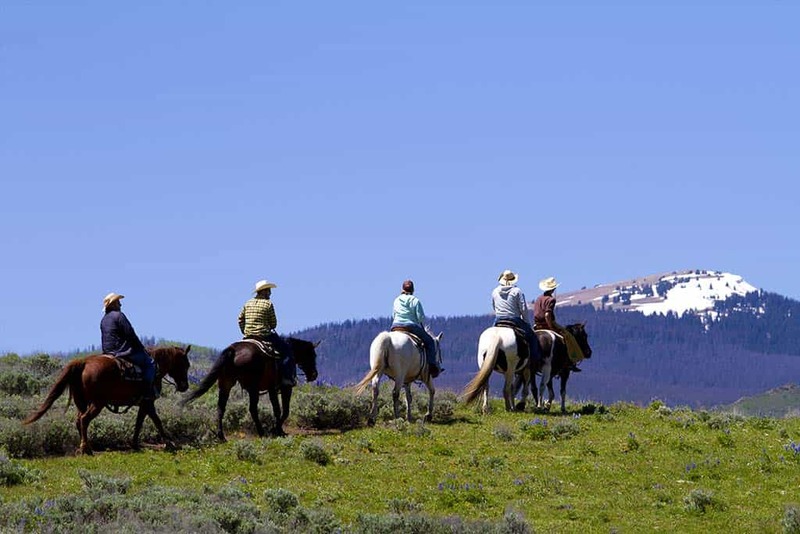 Enjoy beautiful views in every direction on your luxury guest ranch vacation. 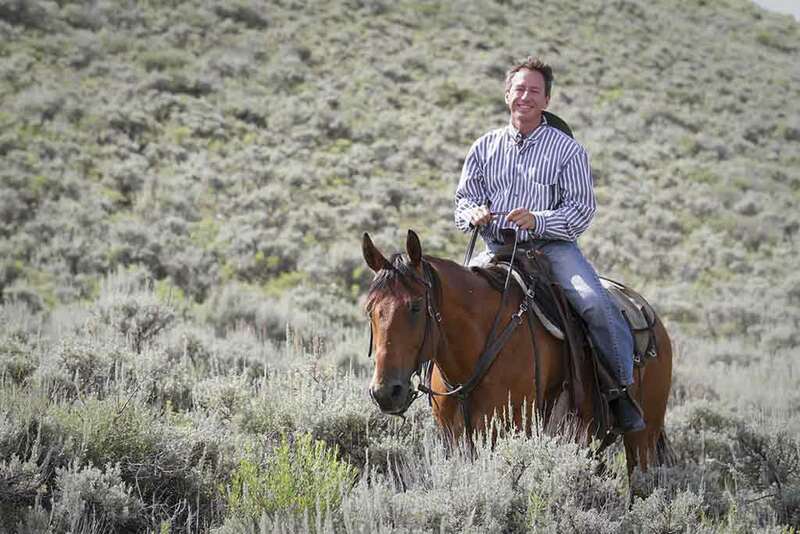 Once you go under our official C Lazy U welcome sign, your dude ranch vacation has truly begun! 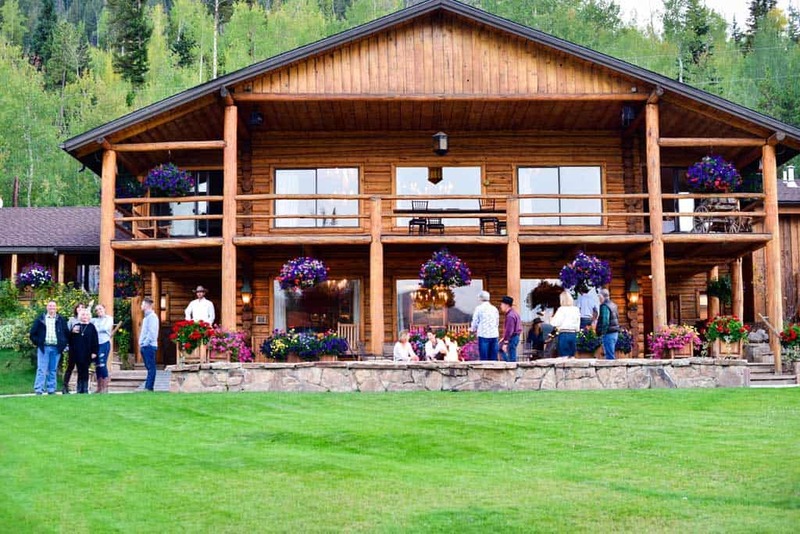 The Main Lodge at our dude ranch is a gathering spot for guests to meet and talk, as well as where we serve most dinners. The old stagecoach sits on the lawn in front of the pond. Notice the sand volleyball court on the right. 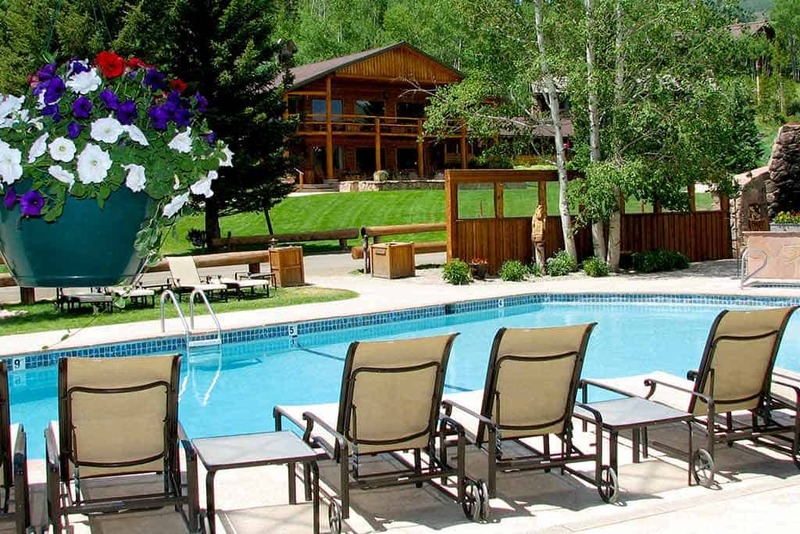 The pool and hot tub outside of the Patio House are a great place to relax and unwind on your Colorado vacation. 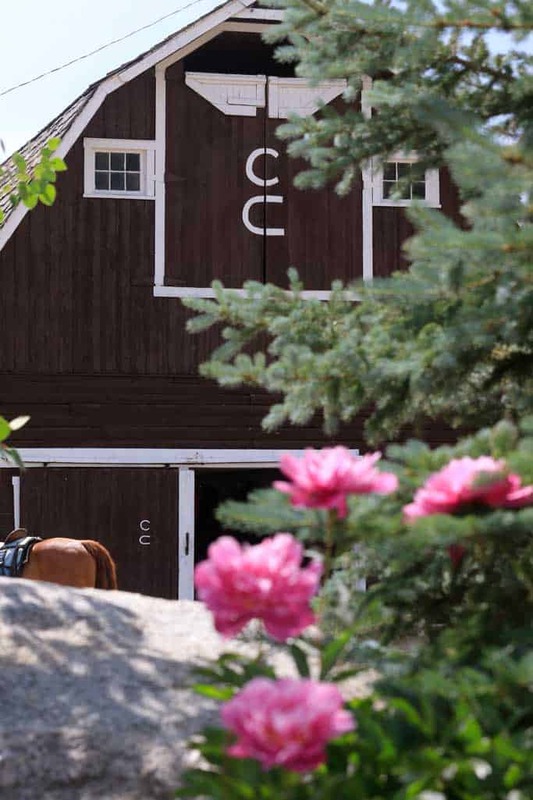 The barn will quickly become a very familiar place to you! We love our animals! After the work and horseback riding is done, they are guided to the pasture for some down time. 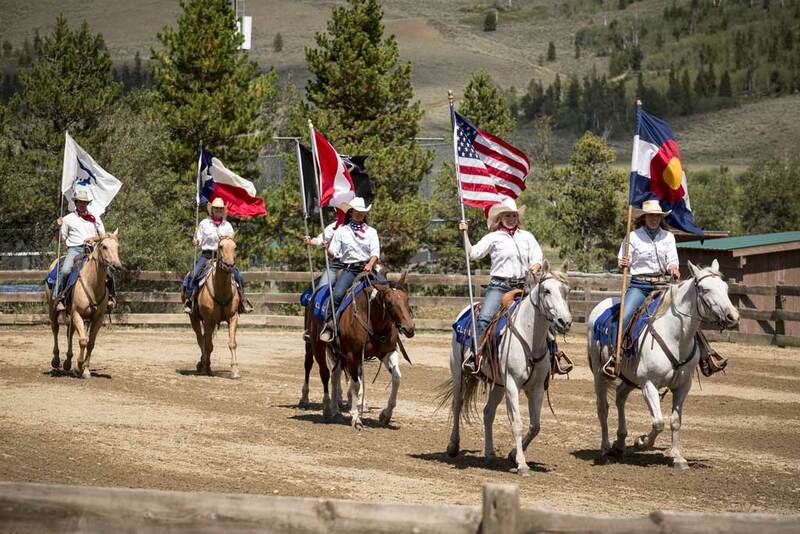 The wranglers lead the horses out. It's a dusty deal, known as the Daily Jingle. There's always work to do here at this guest ranch. 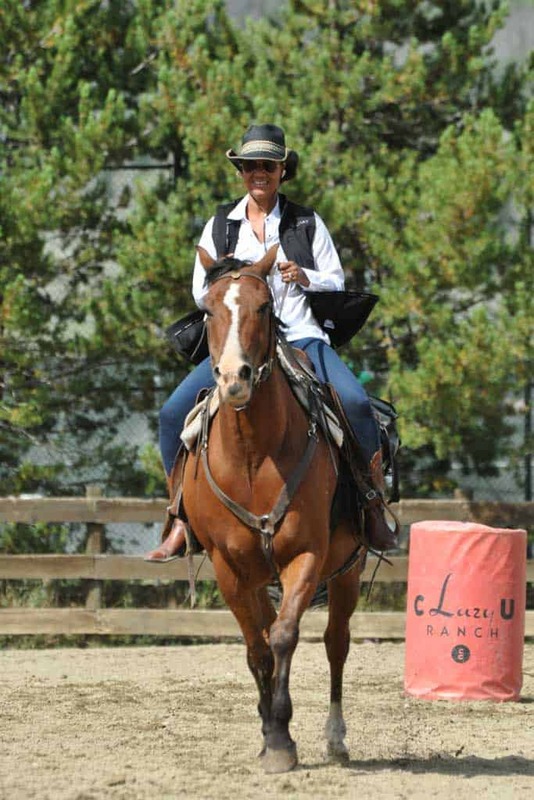 The main ingredient of a successful horseback riding vacation - the horse! Wild moose are just some of the wildlife you'll see while you're here on your Colorado ranch vacation. The Woodsie Overlook is a great place to drink a cup of coffee and contemplate the wonderful day ahead of you. 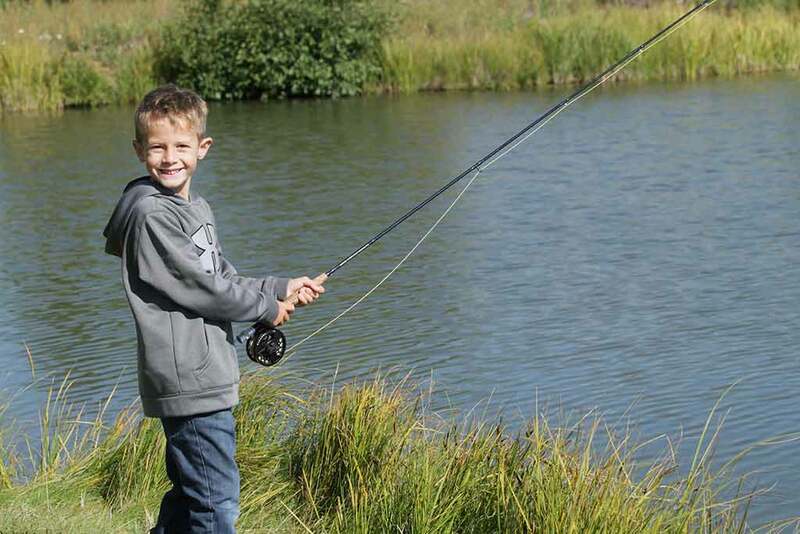 Kids really enjoy the endless summer activities on our guest ranch, especially fishing in the pond! 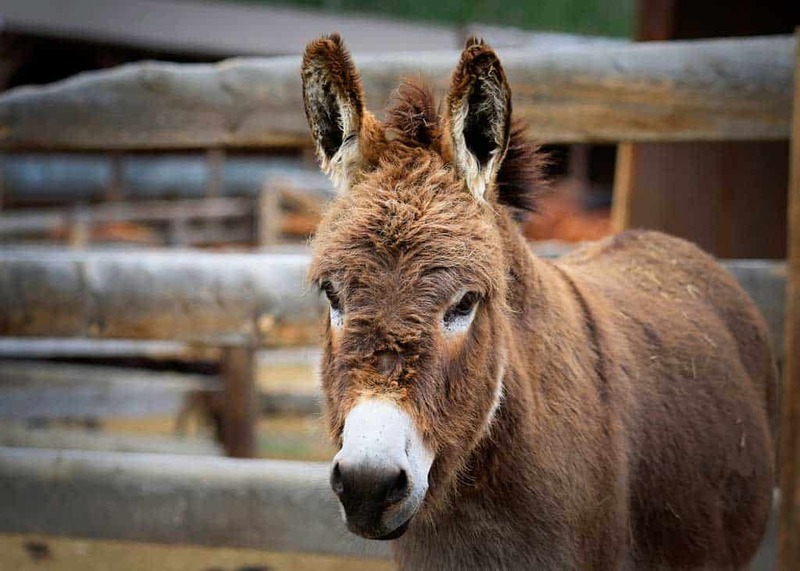 Petey the Donkey is our amazing dude ranch mascot (and a shameless lover of hugs and kisses). The Lazy You Spa (in the distance) is set in some of the most beautiful scenery we have to offer. Yup. 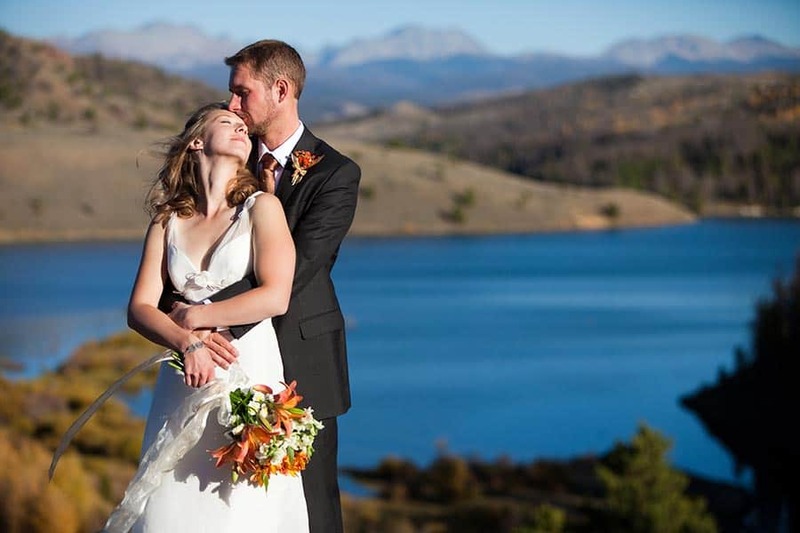 It's really that beautiful when you join us for your Colorado family vacation. 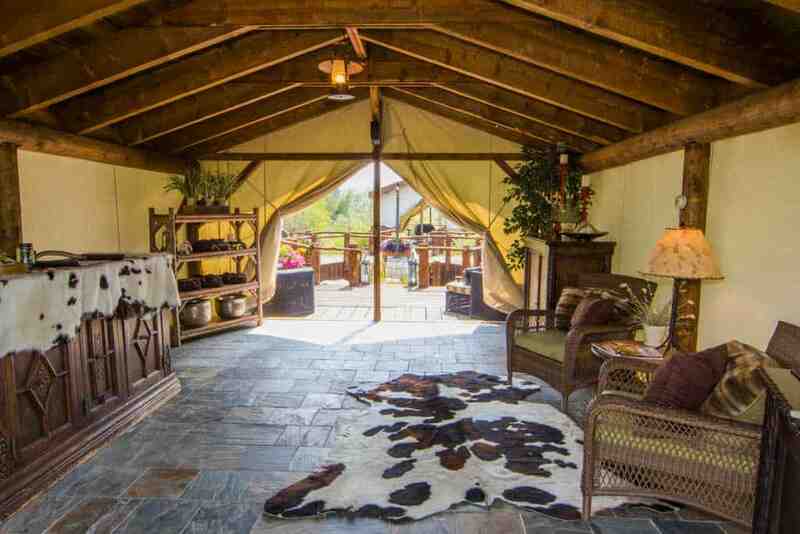 Old west meets horseback riding vacation! If you were a drone, this is how you would see the Ranch. Photo courtesy of Viget. Belly up to the bar for some fine whiskey or a chat with our sommelier. 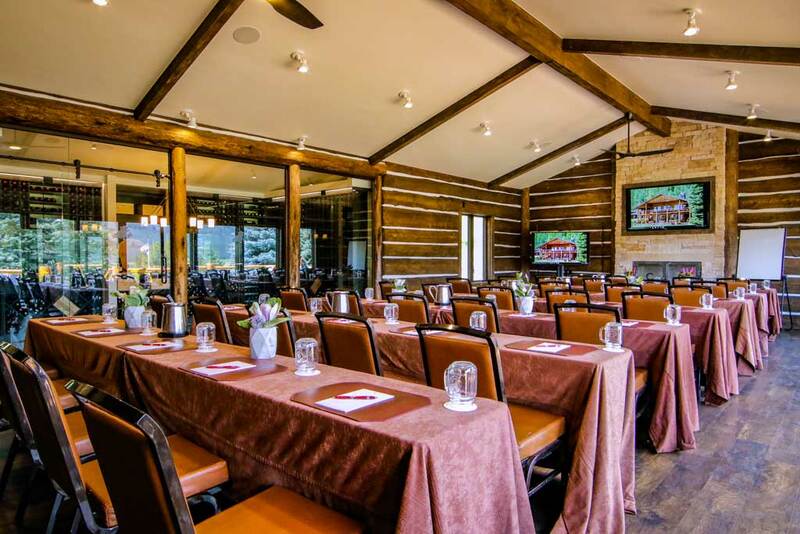 Gourmet meals are served daily in our dude ranch dining room. Inviting breakout space encourage more group interaction. 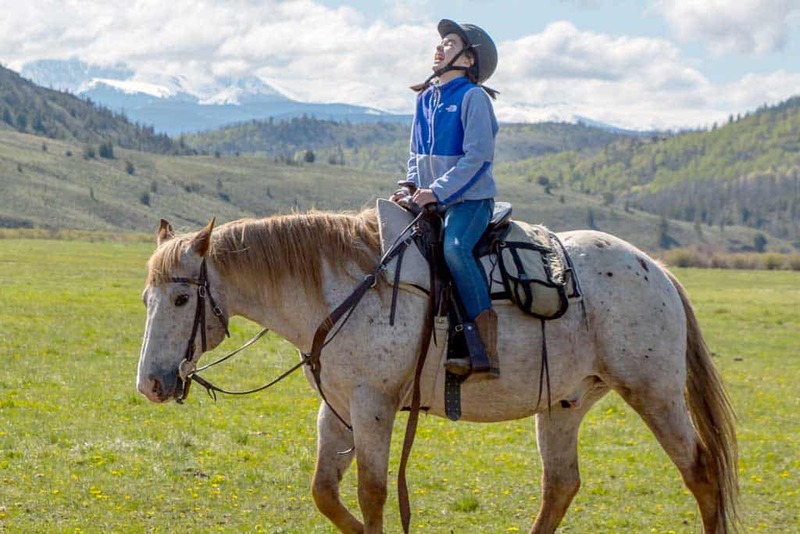 It's easy to gain some perspective on life riding under the big, open sky on your horseback riding vacation. 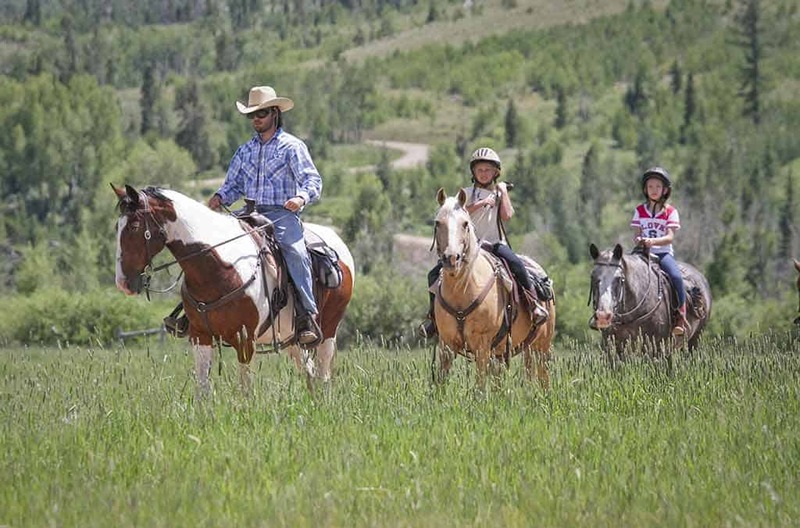 Two children and their guide enjoy the beautiful rolling hills of our luxury guest ranch on their summer vacation in Colorado. 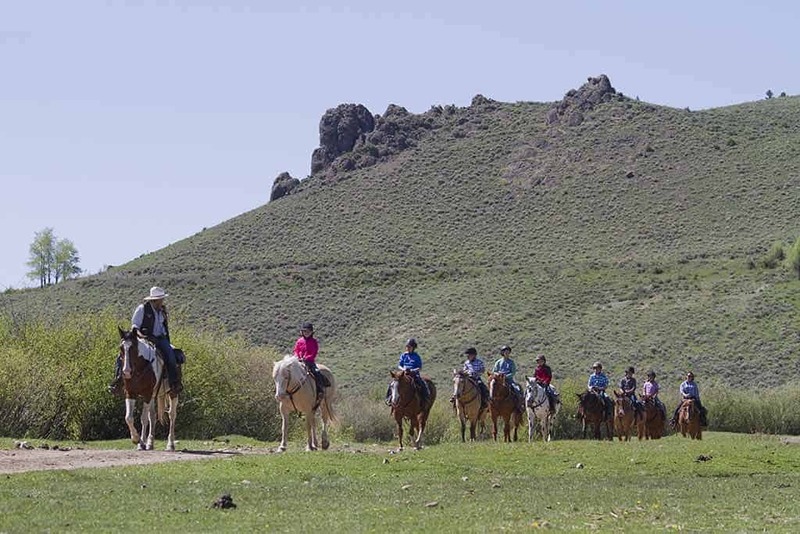 Our all inclusive dude ranch takes you off the beaten trail on horseback. Ditch the car horns and find a new way to get around. 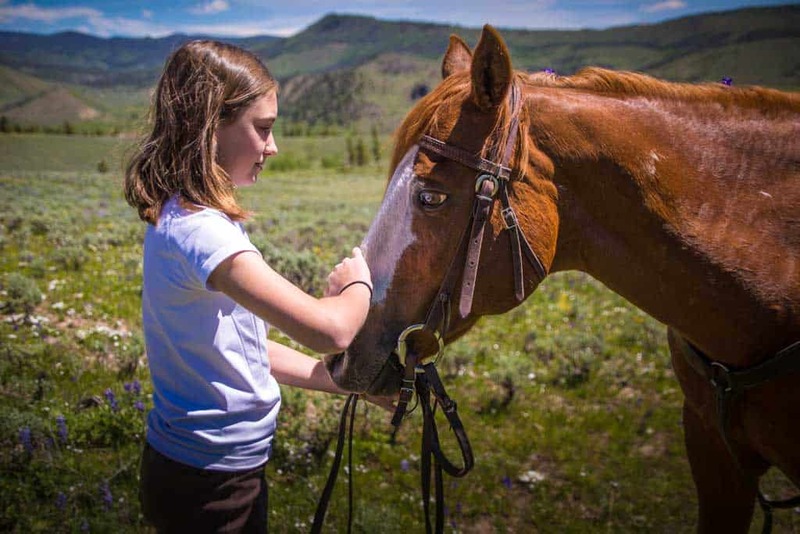 Let your mind and body race free while you embrace the essence of your horse guest ranch vacation in Colorado. 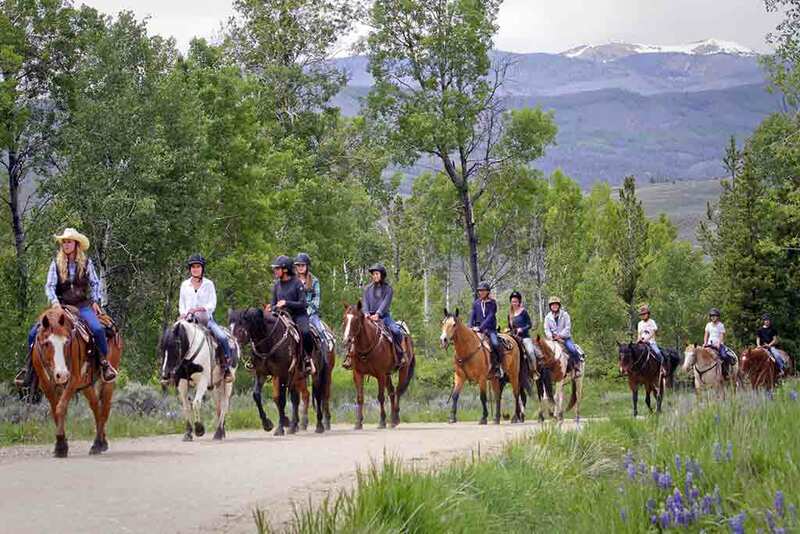 Imagine yourself strolling through the aspens on one of our many guided horseback riding tours on your dude ranch vacation. 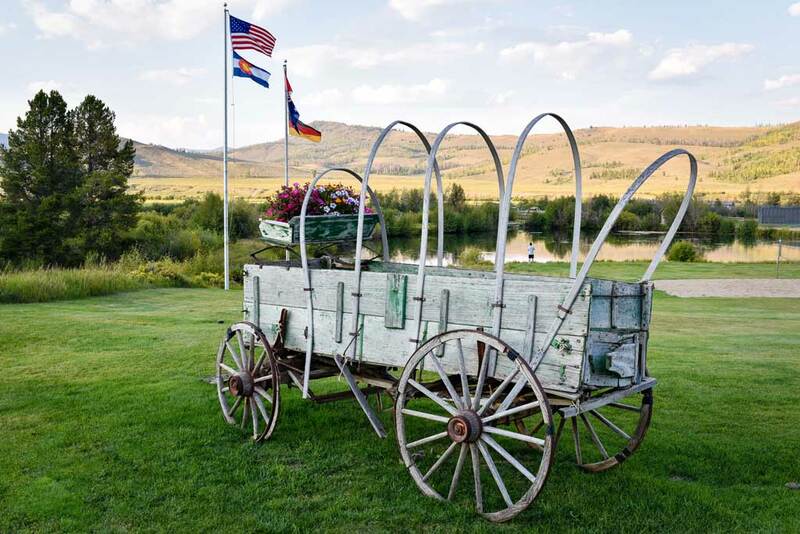 Join us on your summer vacation in Colorado and watch our weekly Shodeo firsthand where we show off our Colorado pride. 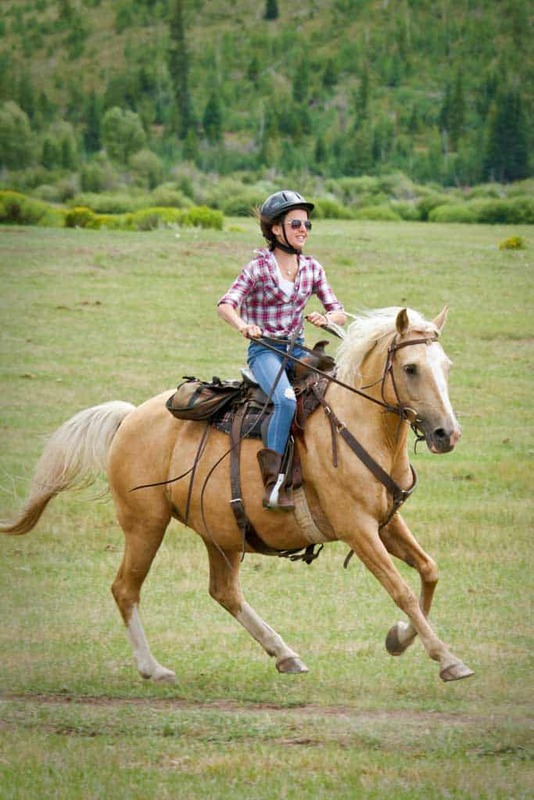 Guests get their chance to show off their own riding skills at our weekly Shodeo as part of their dude ranch vacation. 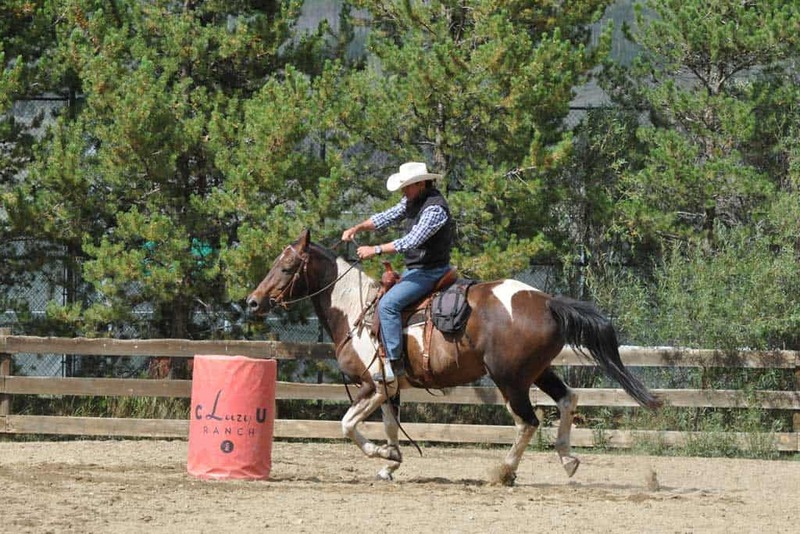 Everyone participates, Colorado dude ranch style, at our weekly horseback riding pole bending event at the Shodeo. And the end of your week you will have bonded with your horse, which is an experience like no other! 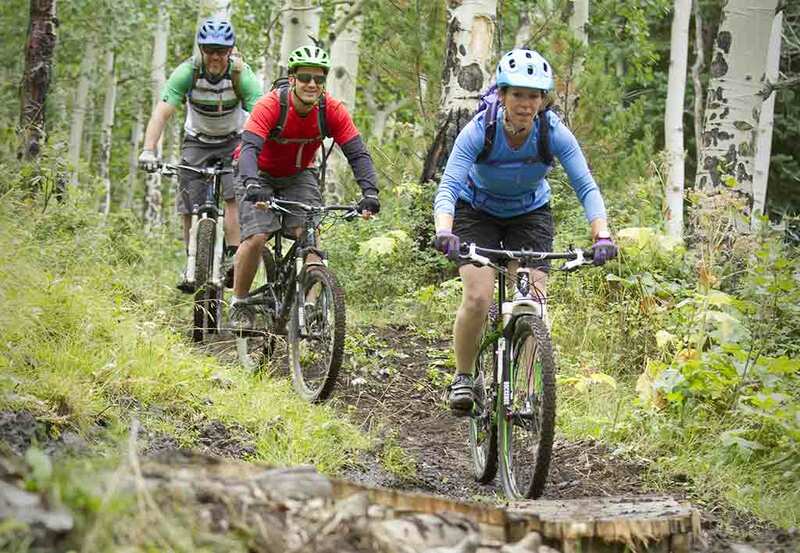 Trade four legs for two wheels on our many local mountain bike trails as a part of your all-inclusive ranch vacation. 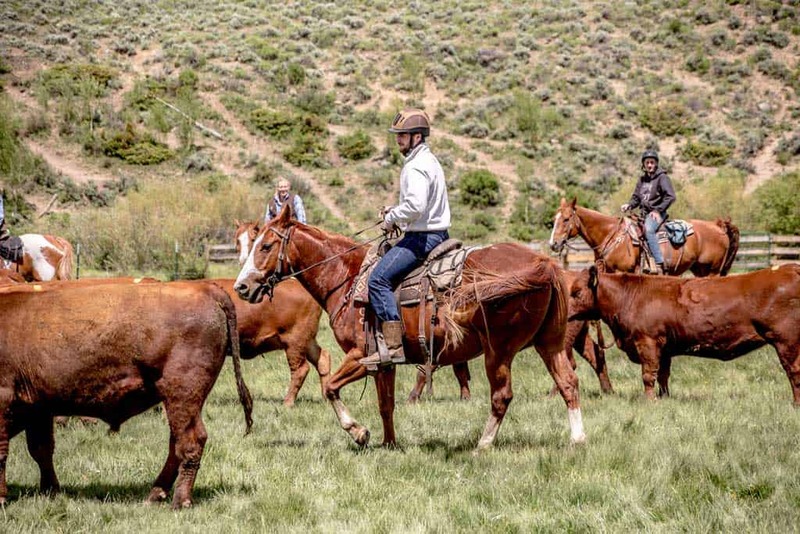 Your dude ranch experience can include cattle pushing. 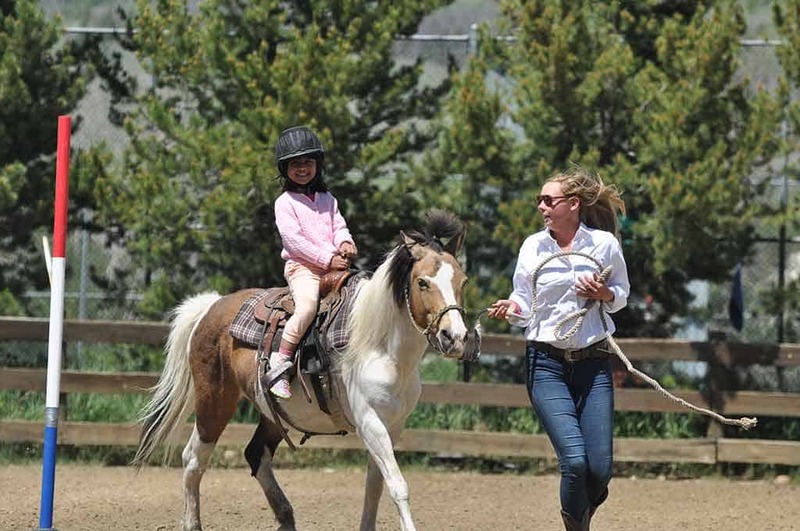 We will make anyone a cowboy or cowgirl at our Colorado ranch! Don't forget, adults get to participate in the Saturday Shodeo too! 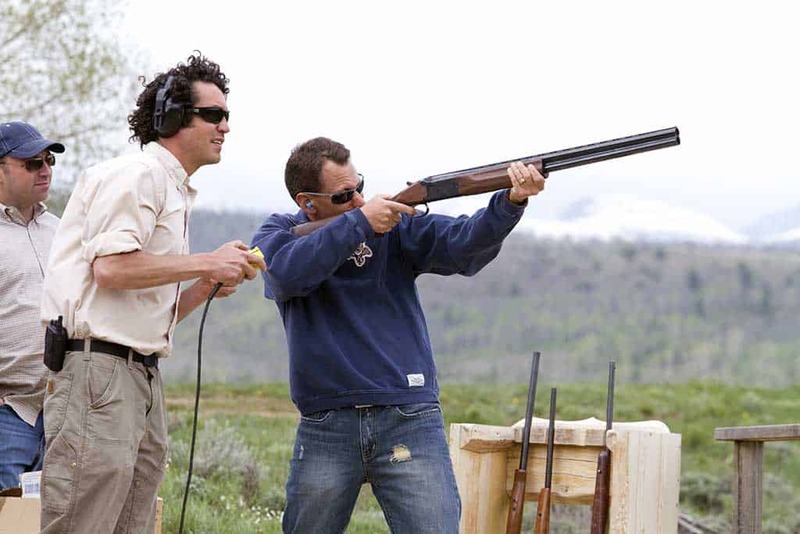 Trap shooting is a fun activity to lead you into hunting trips as part of your all inclusive ranch vacation. 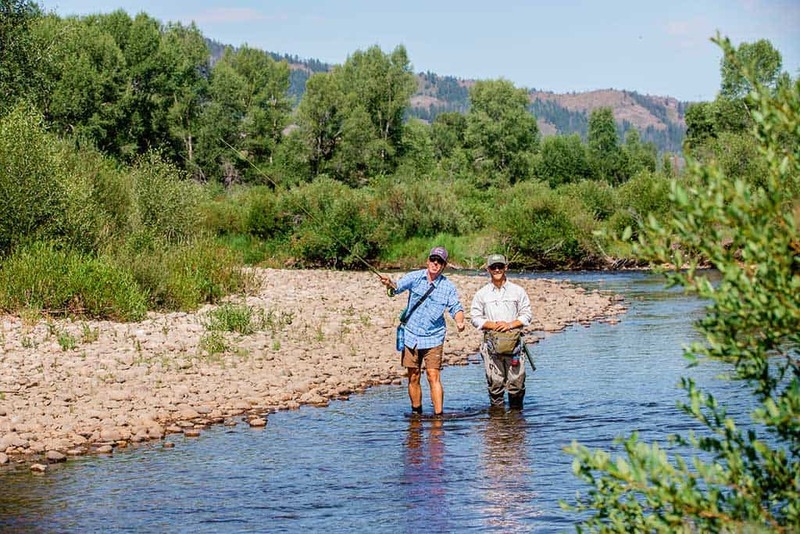 Get a taste of the beautiful Rocky Mountains by taking part in our guided fly fishing trips with trained dude ranch experts. 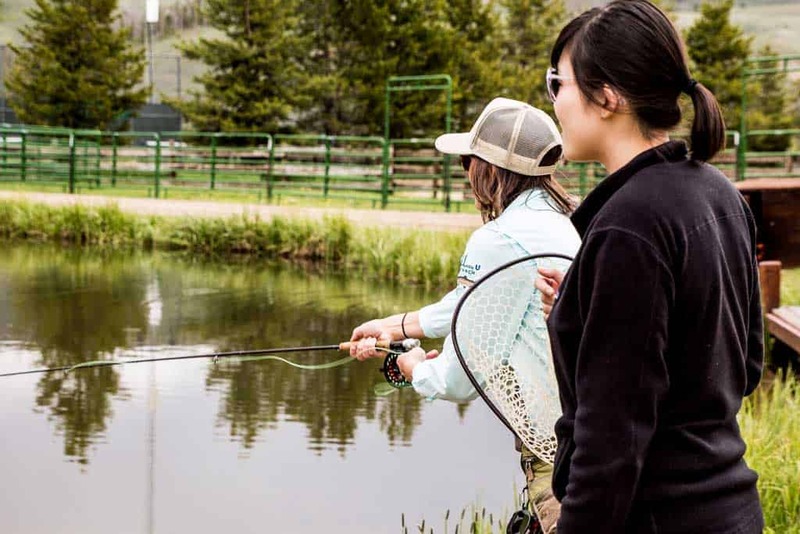 You can also have fun fishing in our pond, if you're not quite ready for a guided fly-fishing trip just yet. 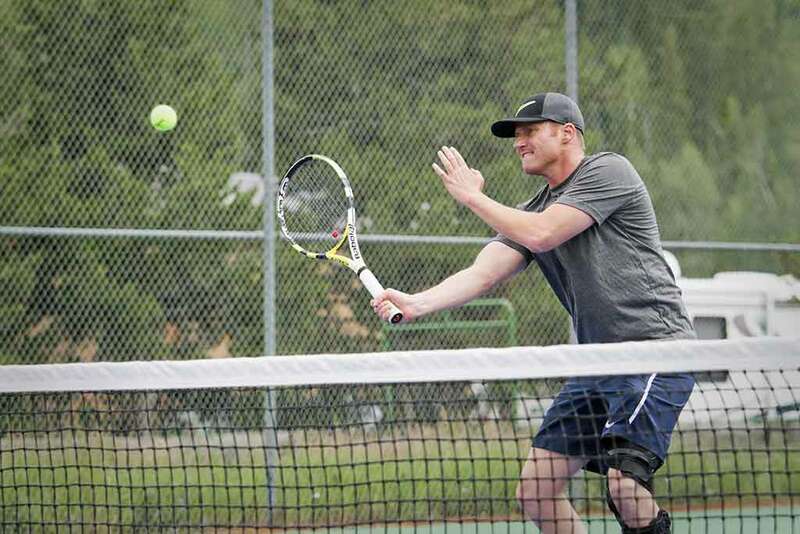 Lace up and hit the court with our two full size Laykold tennis courts as part of your all-inclusive vacation in the Colorado mountains. 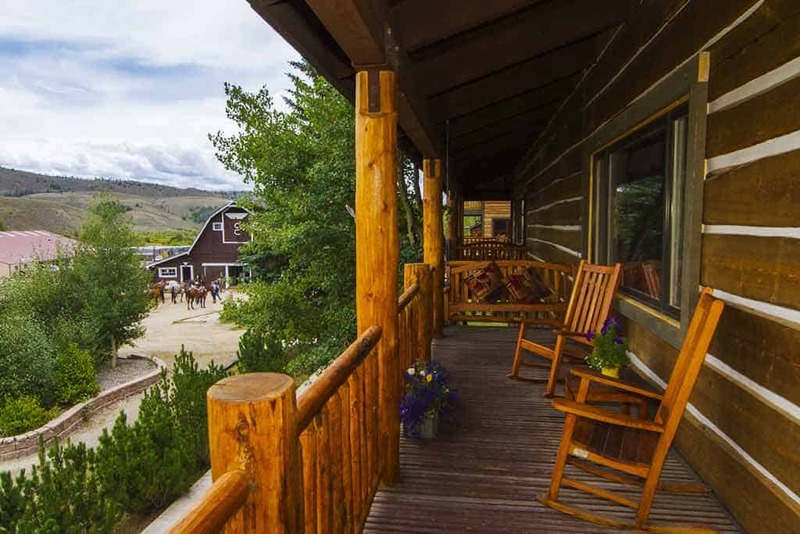 Looking to unwind and relax on your summer vacation in Colorado? Take a dip in our pool! 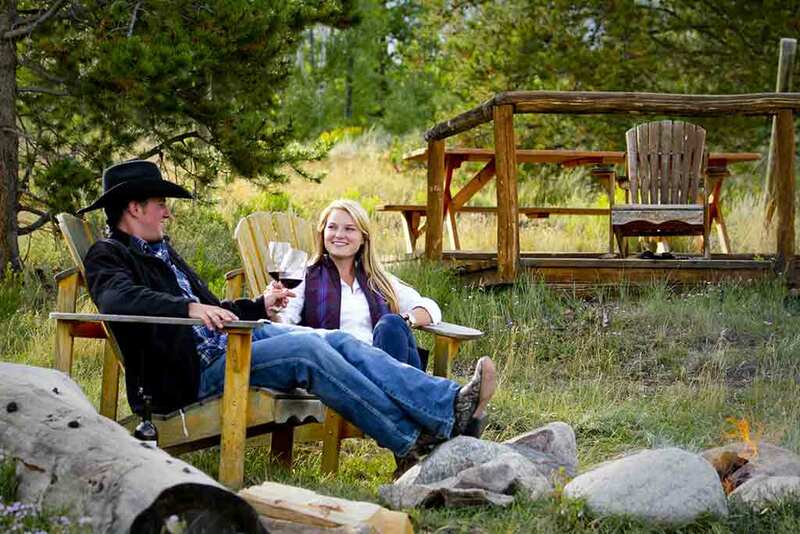 If you're tired after a long day of horseback riding, our luxury dude ranch offers the splendor of a nice hot tub. 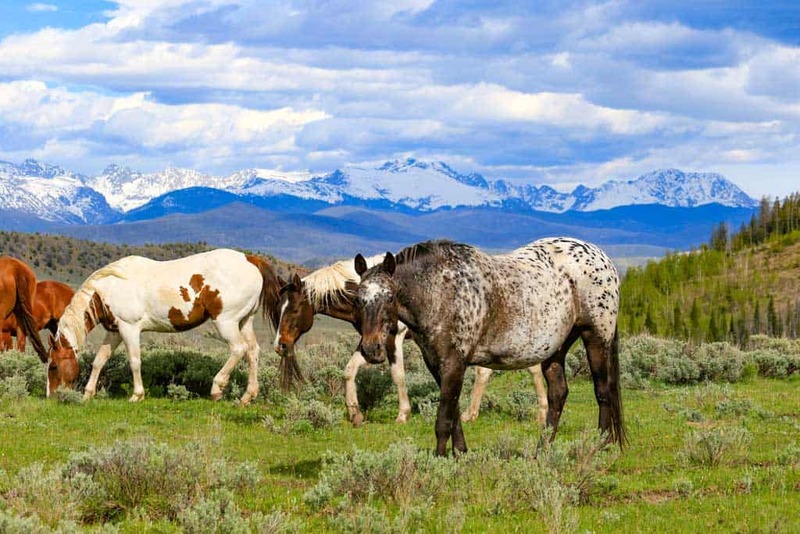 Our Colorado dude ranch has much more to offer than horseback riding. 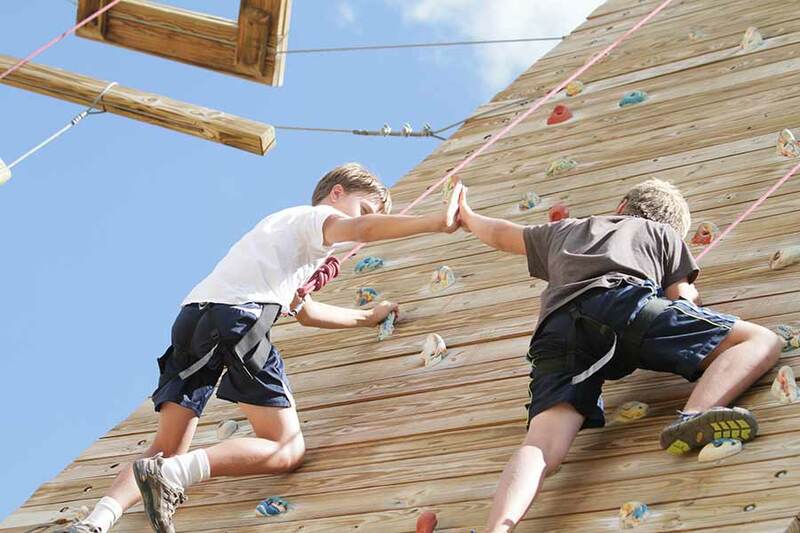 Challenge yourself on our climbing wall and ropes course. 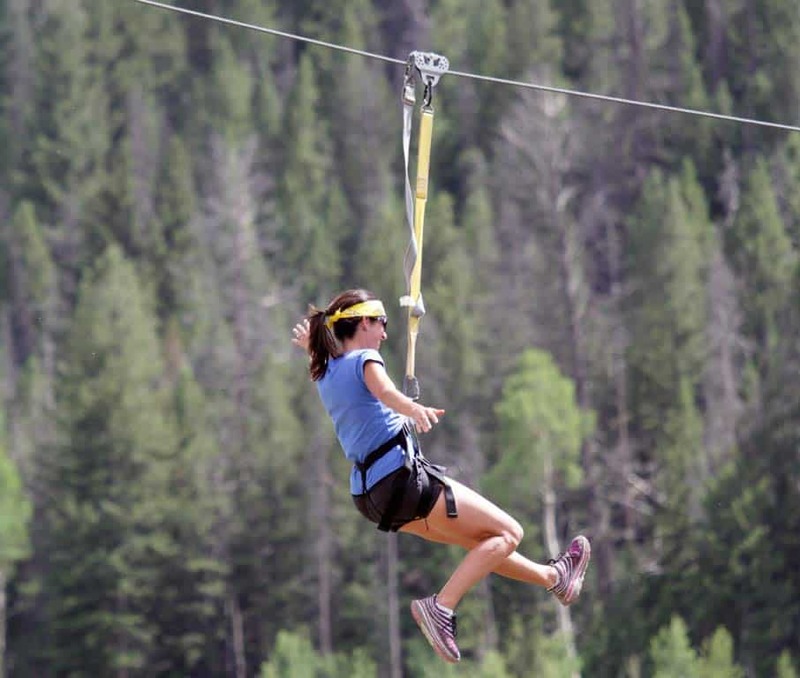 Soar through the air on our exhilirating zipline, just one of the many variety of activities available to you on your colorado guest ranch vacation. 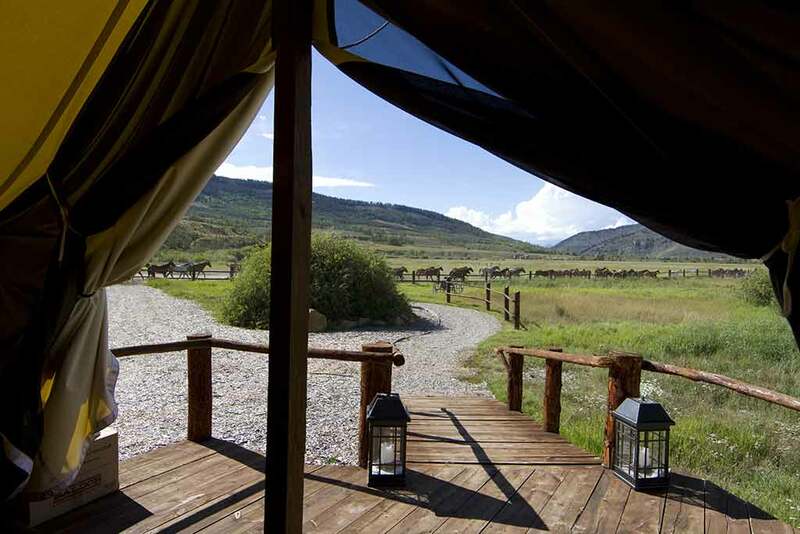 Your ranch vacation at the C Lazy U guest ranch in Colorado can even include glamping (luxury camping). 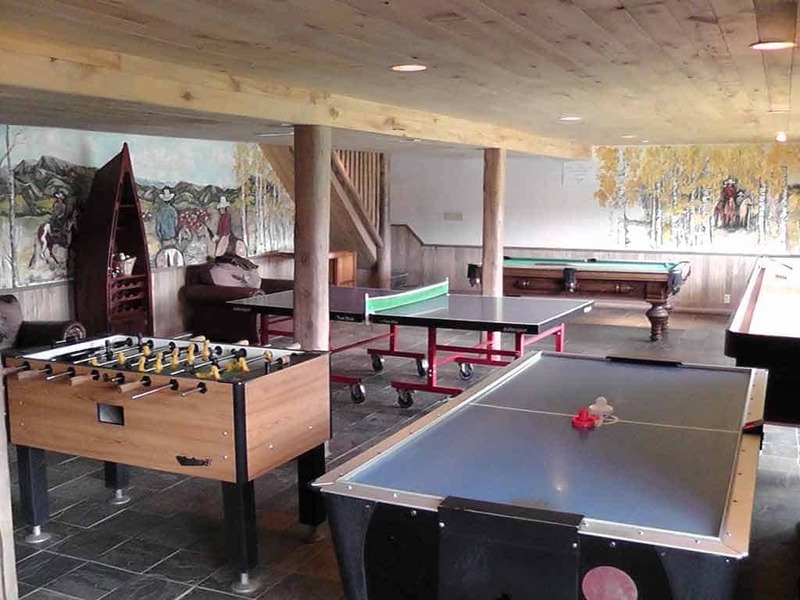 Recharge your batteries by playing foosball, pool, or ping pong table in the game room of our all-inclusive dude ranch. 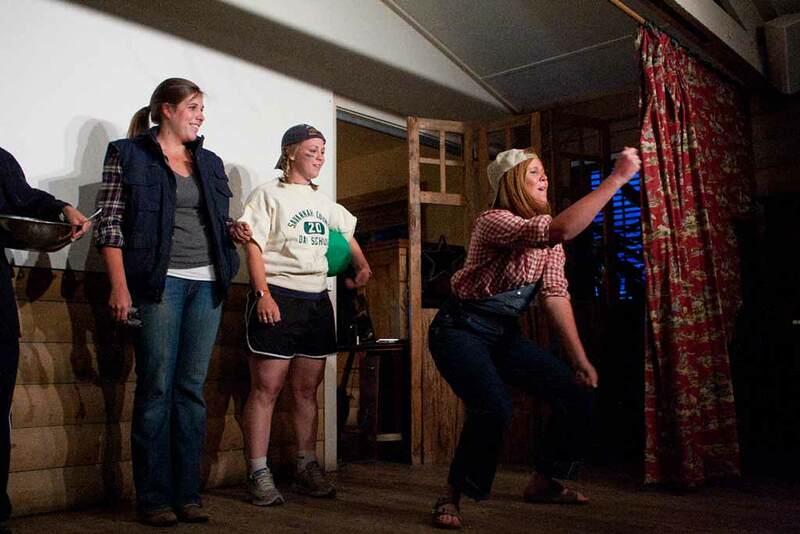 Have a good laugh with new and old friends or show off your new dancing skills at our weekly talent show. 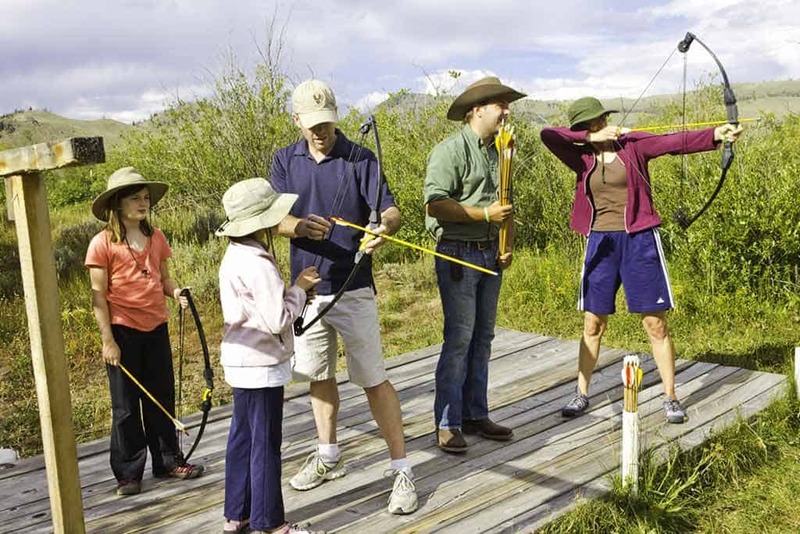 Learn archery with compound bows during your dude ranch all-inclusive vacation. 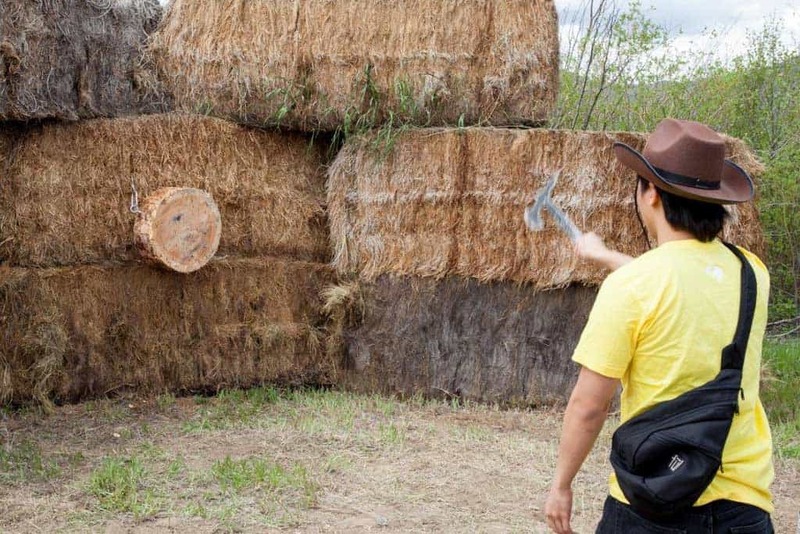 Hatchet throwing is fun, great exercise, and we make sure it's safe as well. 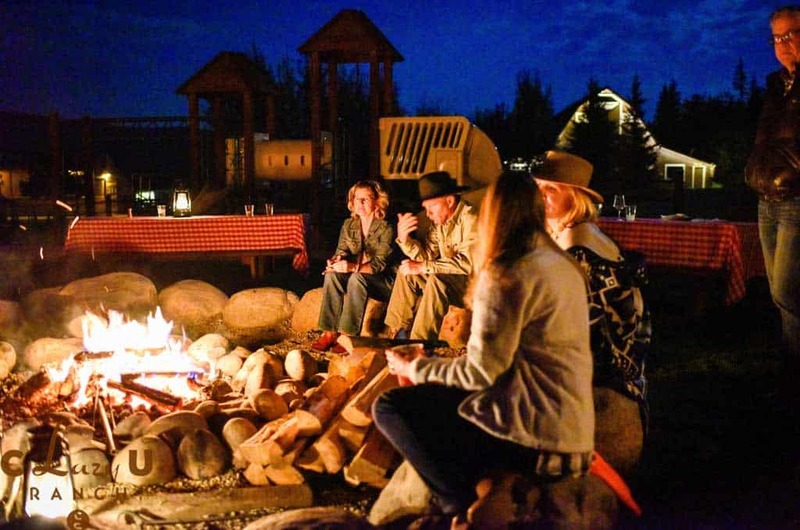 Relax and share stories with other guests around a campfire in the evening. 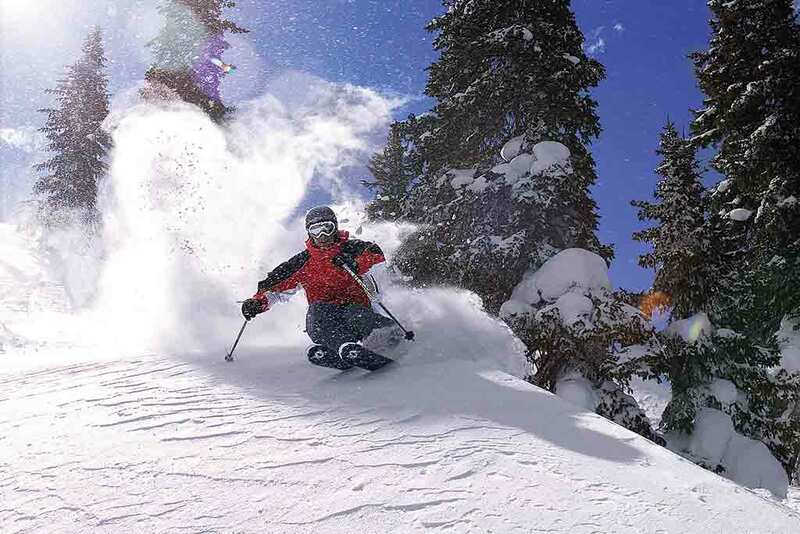 Want a winter vacation in Colorado and don't want to deal with the crowds at a ski resort? Take our complimentary shuttle to the nearby resorts and still enjoy the peace at C Lazy U! 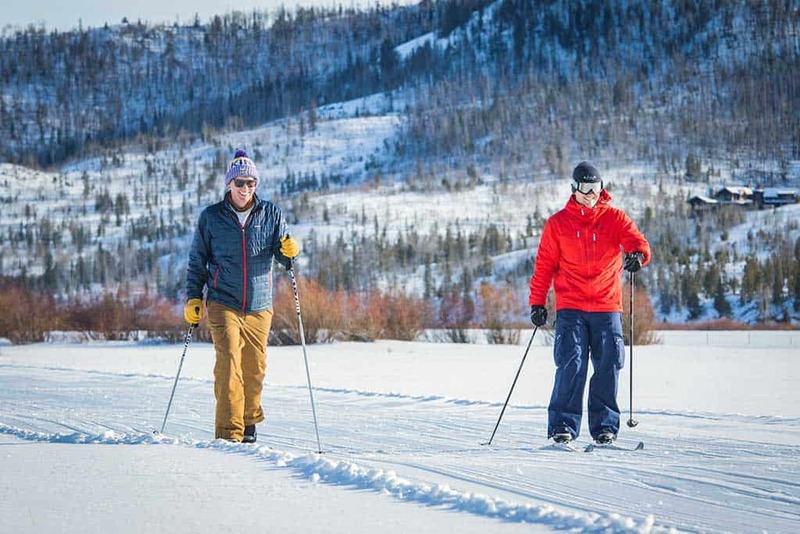 We have hundreds of acres of cross country skiing that will lead you on a Rocky Mountain adventure on your winter vacation in Colorado. 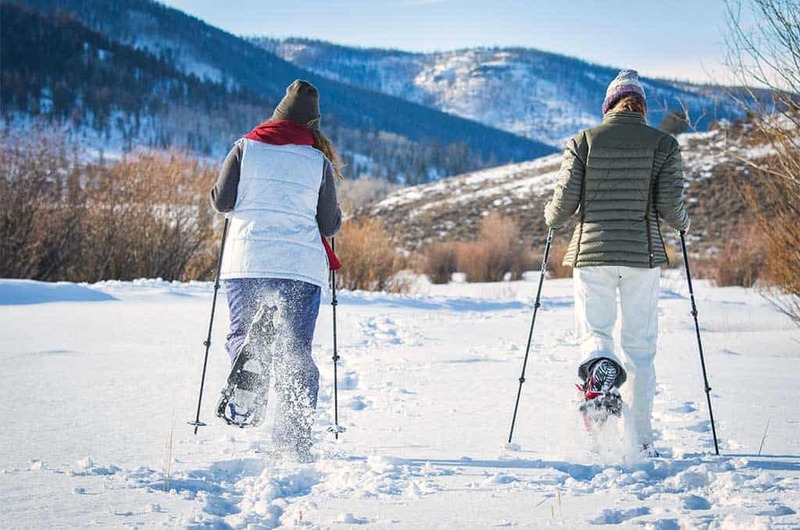 It would not be a Colorado winter vacation without strapping on the snowshoes and exploring the beautiful backcountry of the Colorado mountains. 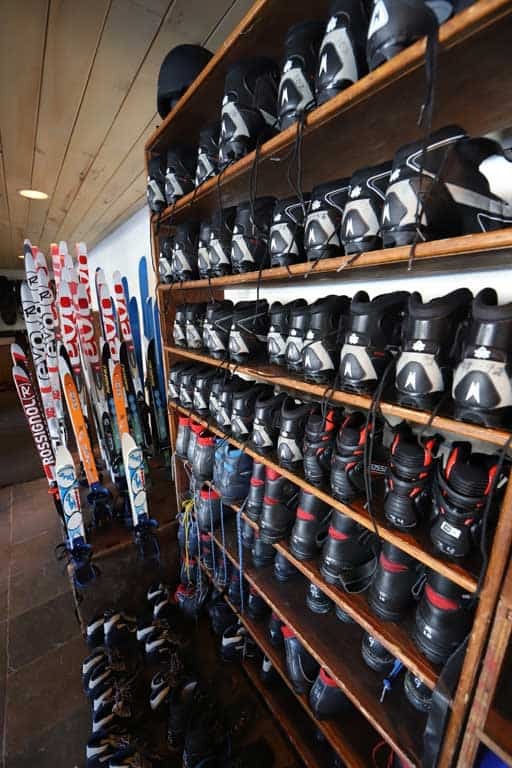 The ranch has all the the equipment you'll need to get out in the snow and ski or trek. Don't forget your camera! 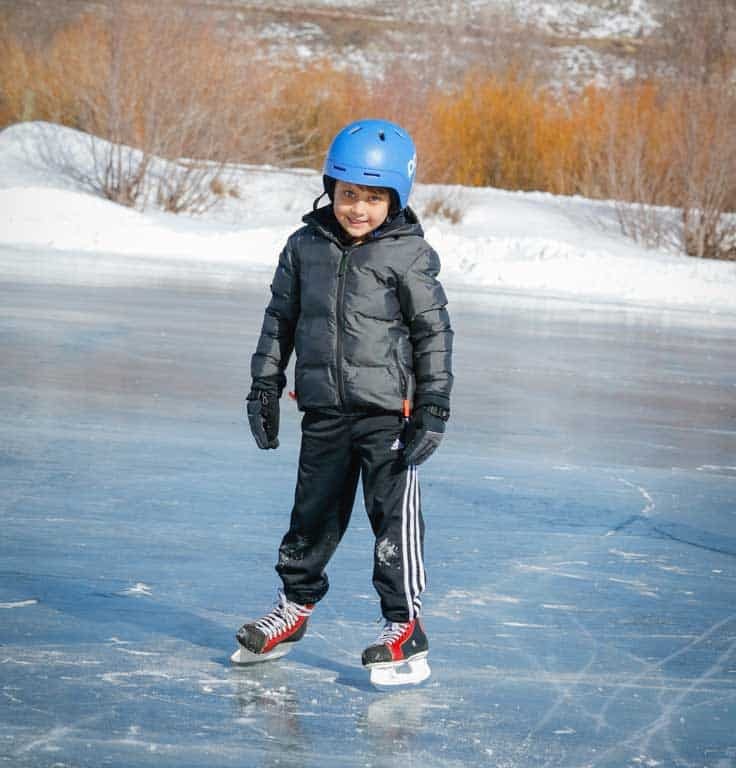 Ice skating on our pond is not like skating on any other pond! We use a real Zamboni on it to make it as smooth as a rink so you practice your moves. 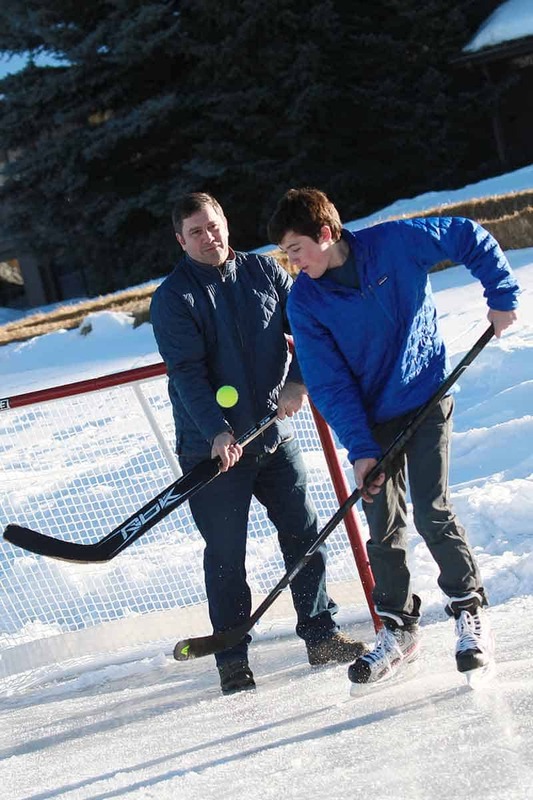 Go ice skating or play hockey on our zamboni-groomed pond during your beautiful winter vacation in Colorado. All equipment provided! 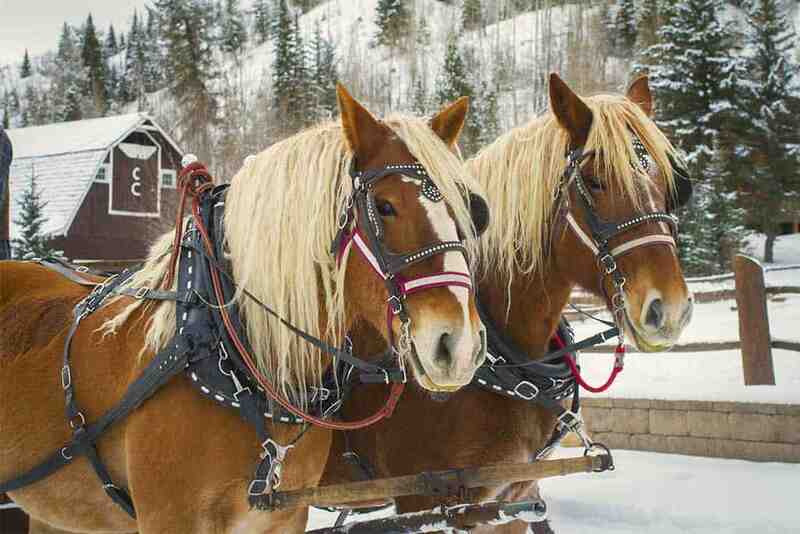 Cozy up to those closest to you on our horse-drawn sleigh rides, a perfect bonus to a Christmas Colorado vacation. 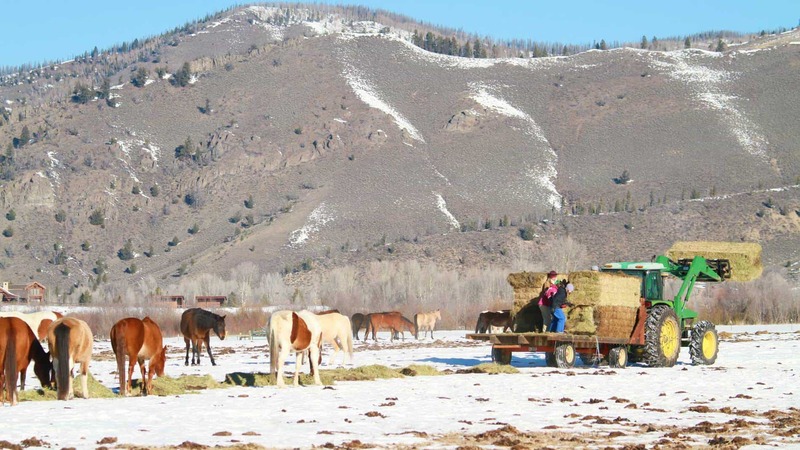 During winter vacations at C Lazy U, you get to help feed the horses! 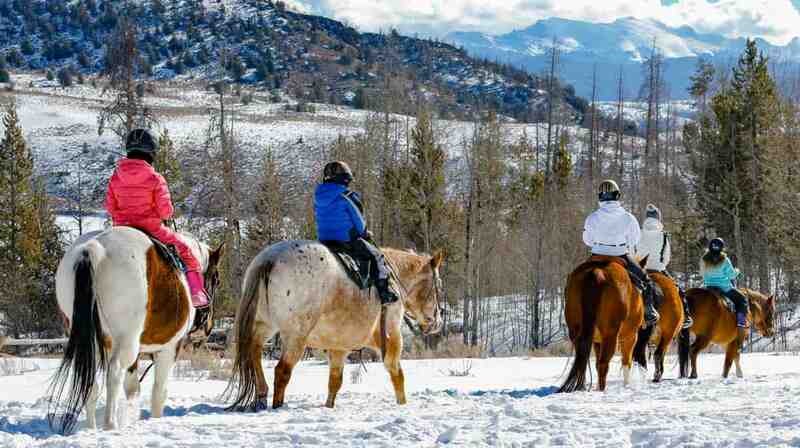 Of course, horseback trail rides are still on the agenda for a Colorado winter vacation at C Lazy U! Shooting a bow and arrow can be challenging. Our dude ranch counselors give the children some tips on hitting the target. 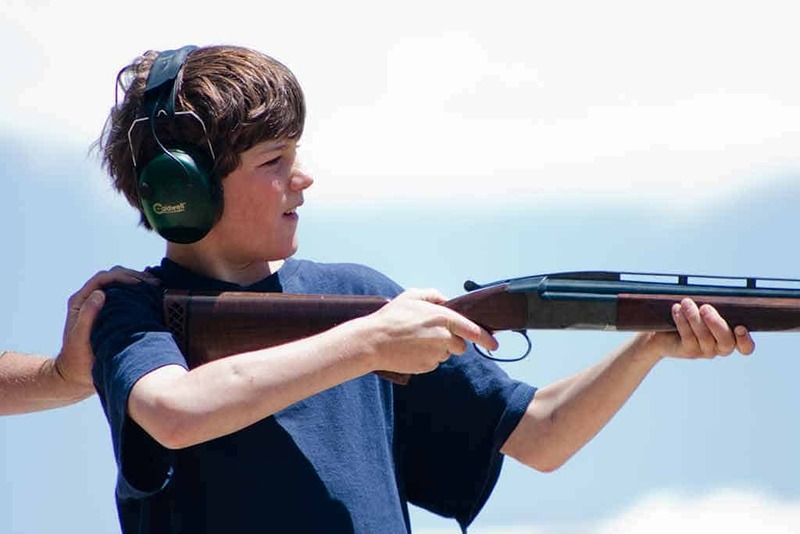 Your kids will have safe fun with our trap shooting activities as part of your family vacation in Colorado. 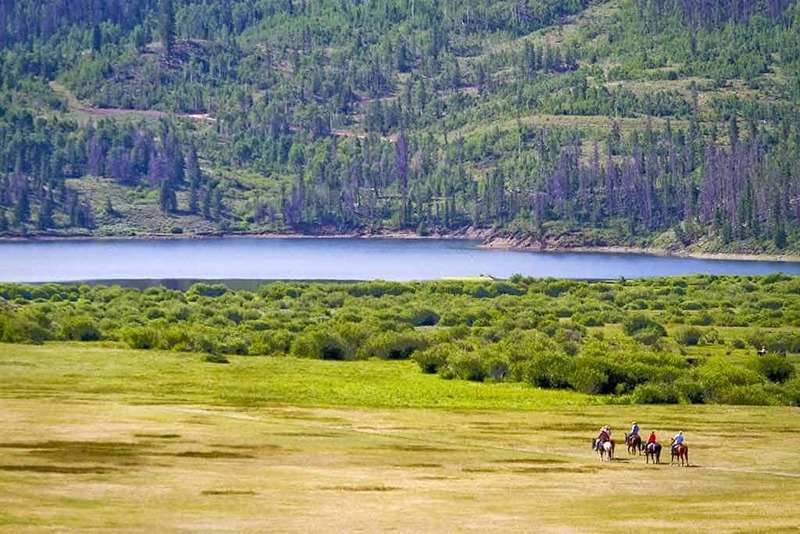 Enjoy the tranquility of the beautiful Colorado mountains while on a paddle boat on our guest ranch lake. 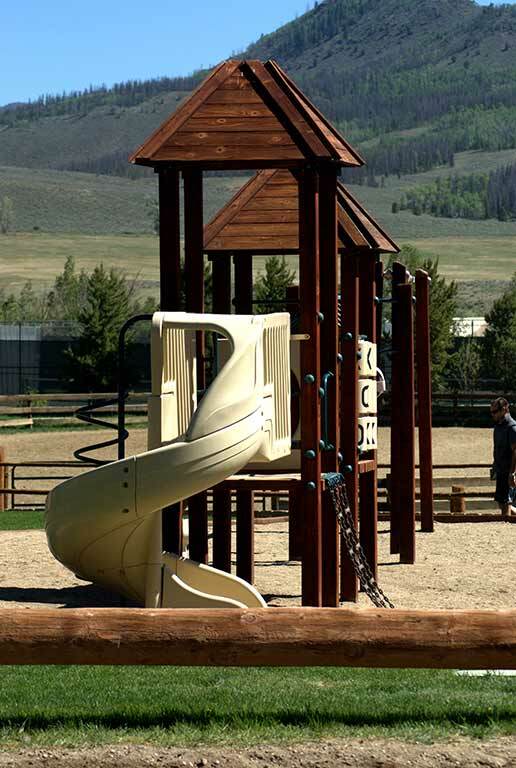 The playground is always a hit with the kids and is a fun way to spend a few hours relaxing on your Colorado family vacation. It wouldn't be a complete trip out west to Colorado without panning for gold. You might strike it rich! 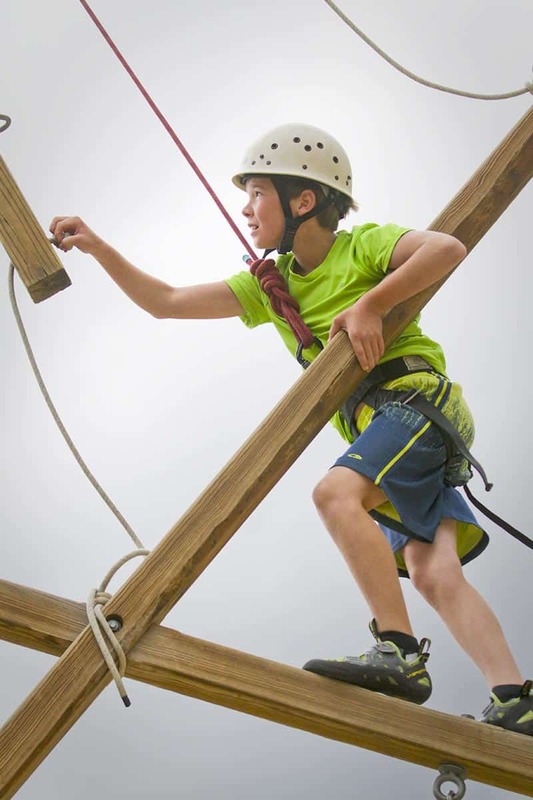 The ropes course is a challenging but fun and rewarding activity for teens as part of your all-inclusive Colorado vacation. Supervised games and challenges are not only fun for the children, but create lasting memories that they will cherish into adulthood. 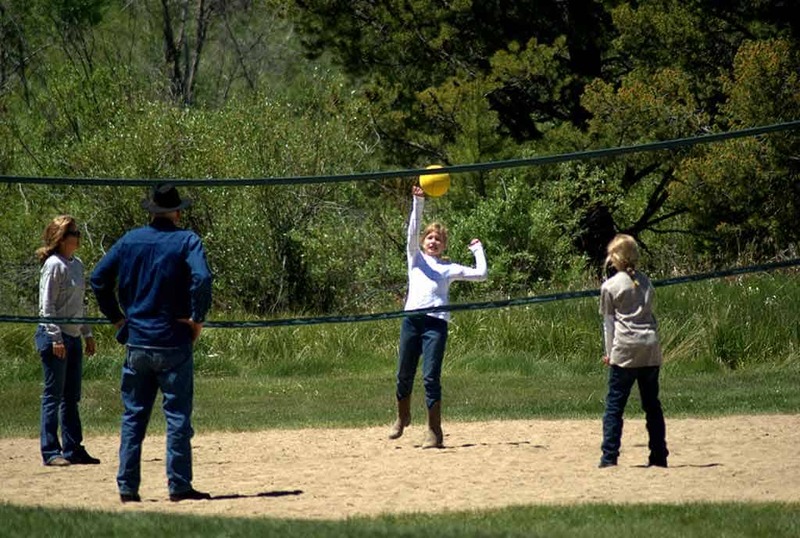 Gather the troops and new friends at the C Lazy U dude ranch to play a friendly game of volleyball! 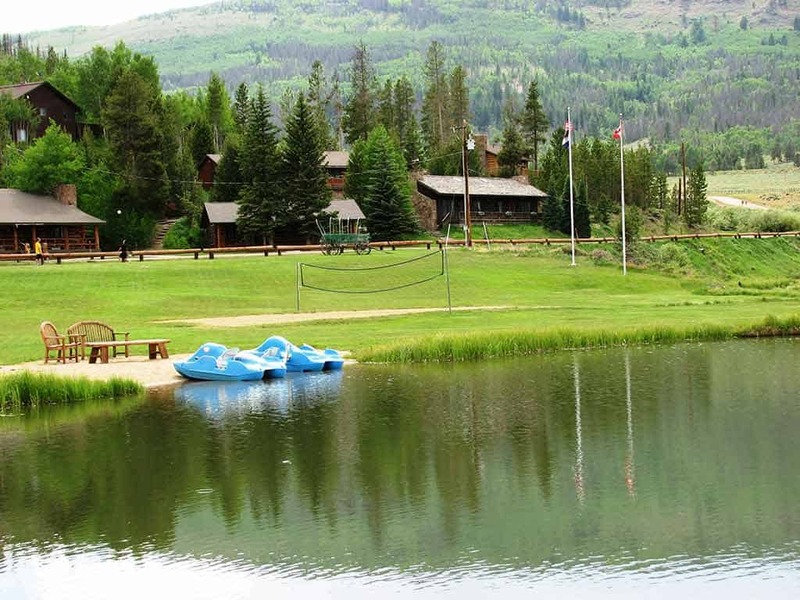 Our all inclusive dude ranch also offers a stocked fishing pond ready for you and the family to reel in a big catch. 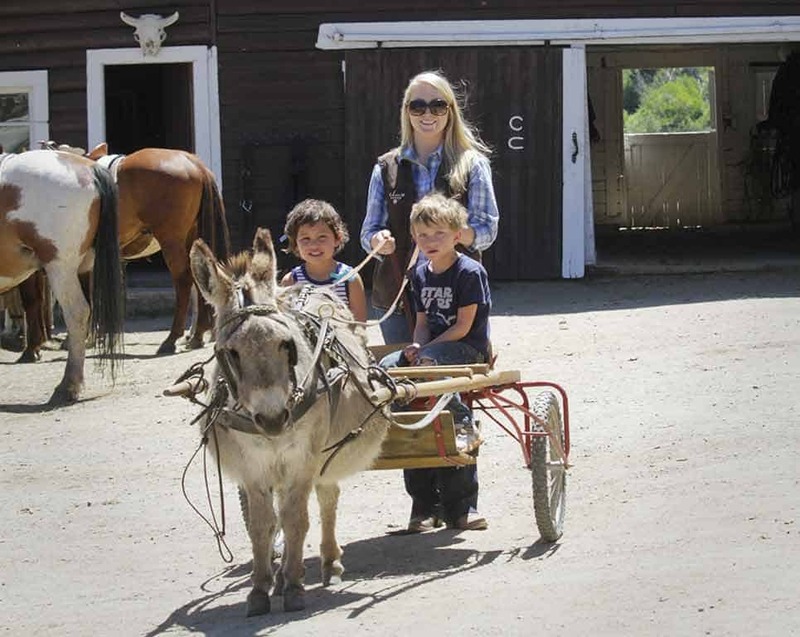 Only the littlest kids are the most excited and cool enough for donkey cart rides at our Colorado dude ranch. 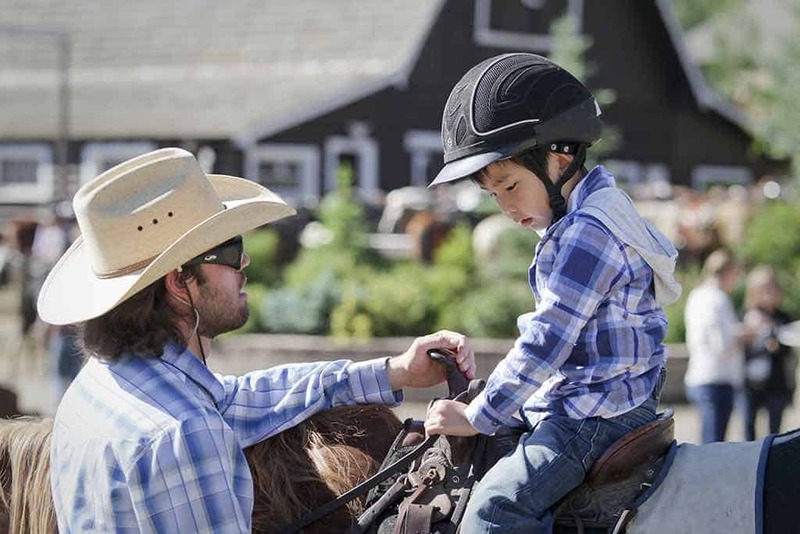 No matter what the kids do, we make sure everyone stays safe on our family vacation horseback trips - helmet included! 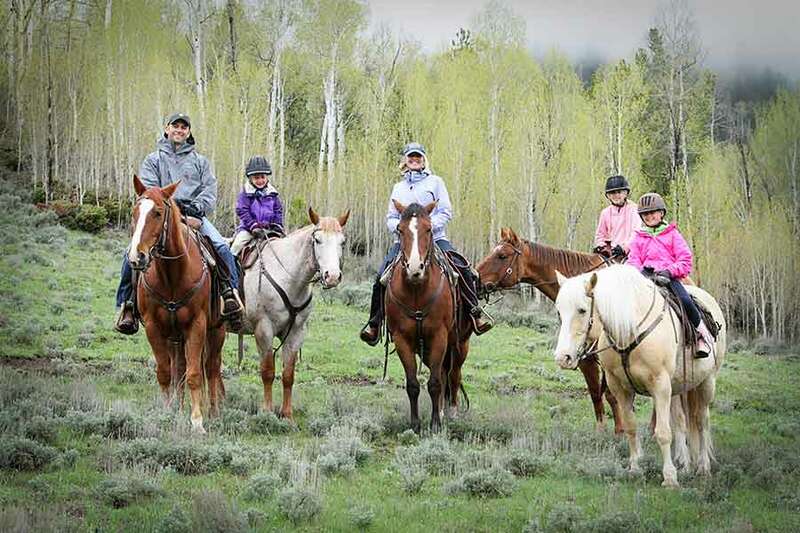 The kids eagerly listen to the pre-ride instructions before beginning their horseback riding vacations. 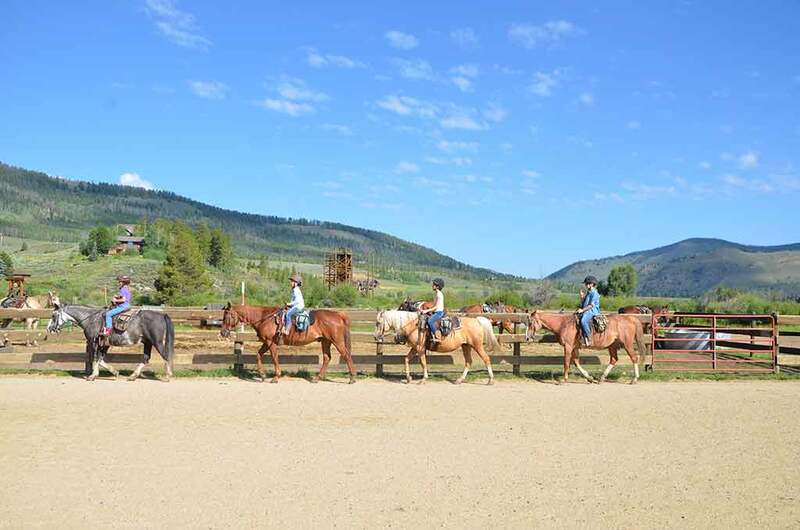 Our Colorado dude ranch includes an arena for practice to make sure everyone is ready for their horseback riding trip. 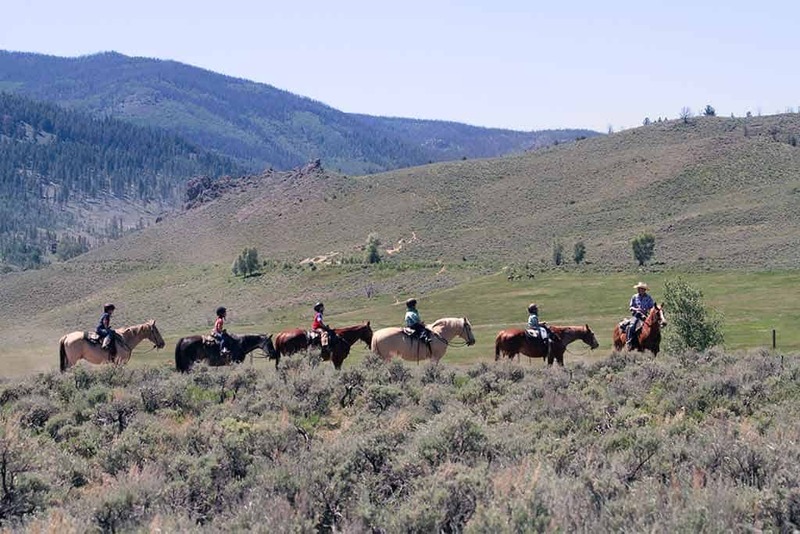 After some practice, everyone is off to the range to start some real horseback riding against the backdrop of the Colorado mountains. 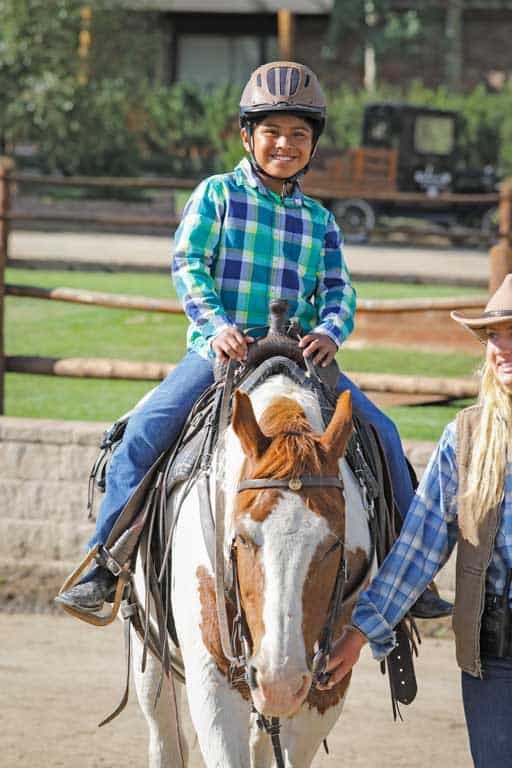 Our trained dude ranch experts ensure all the kids stay together and are safe while enjoying their time on our horseback riding trips. 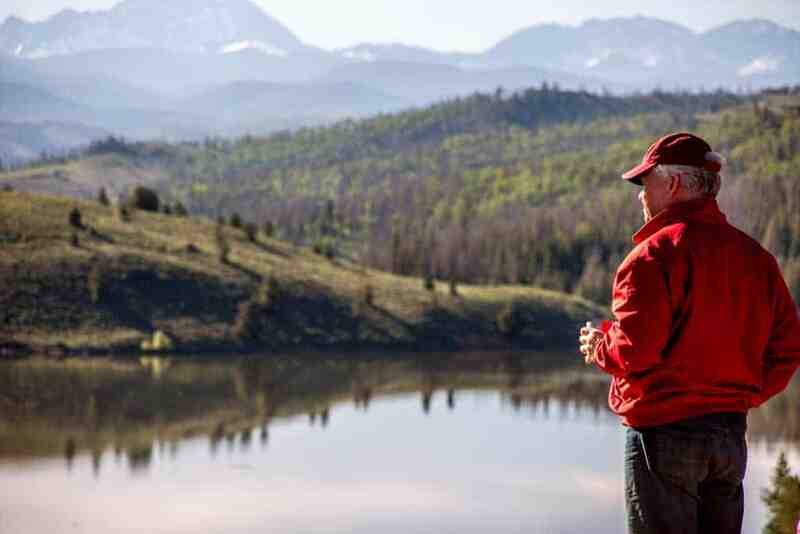 While out on the ride, take a moment to soak in all the views of the Colorado mountains surrounding our dude ranch. 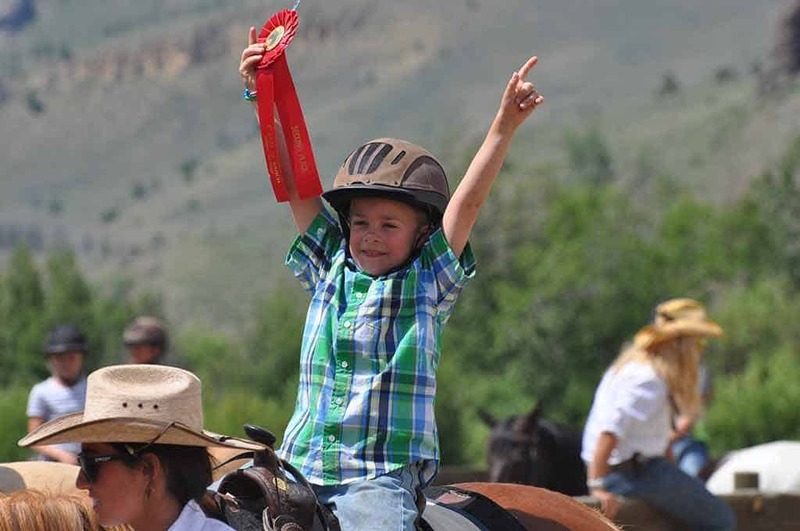 Ready to see your kids grinning this big on your next Colorado family vacation? Our dude ranch will make it happen!. 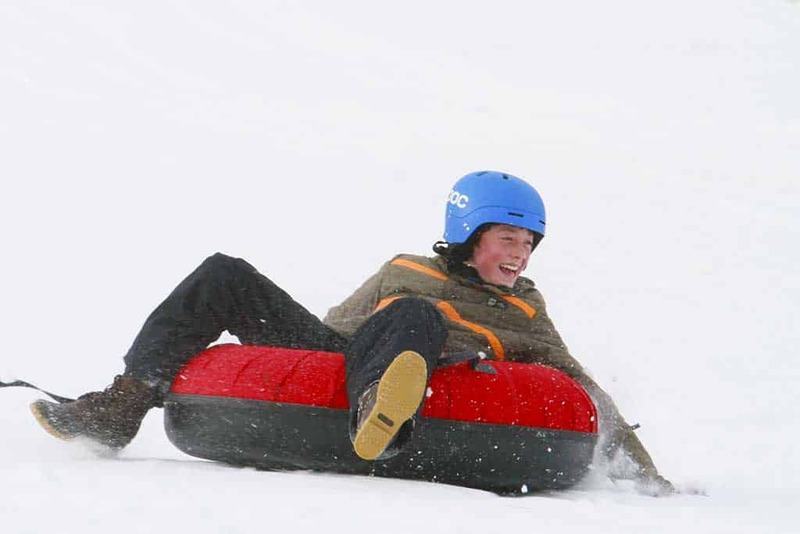 Our kids program is a great way to make sure the whole family has an absolute blast on your family vacation in Colorado. 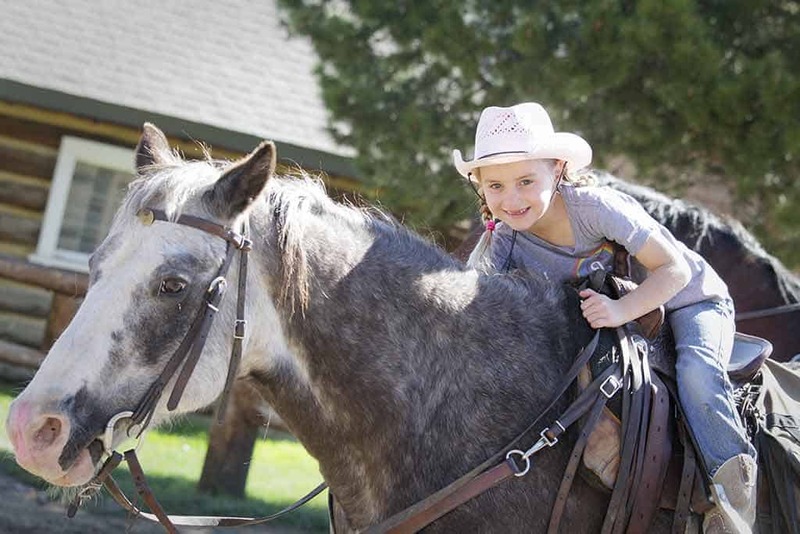 Pony rides are some serious fun for the little cowpokes. 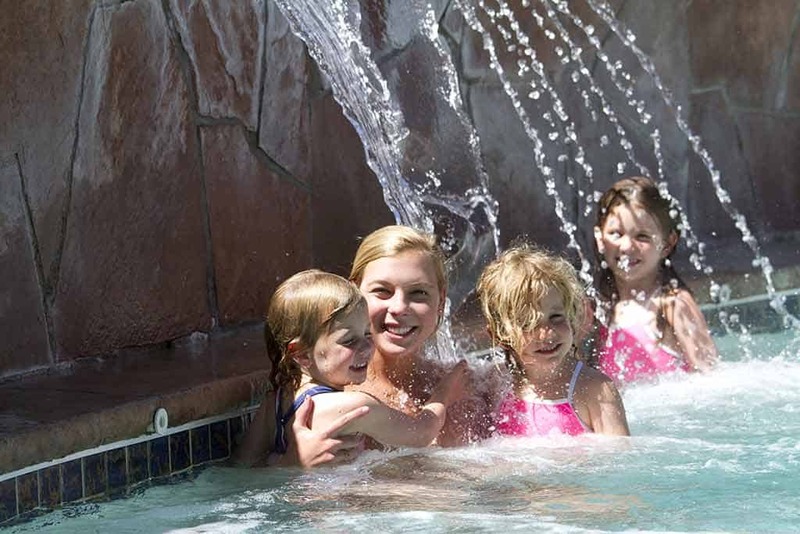 It's a perfect way to ensure your little one smiles on their Colorado family vacation. 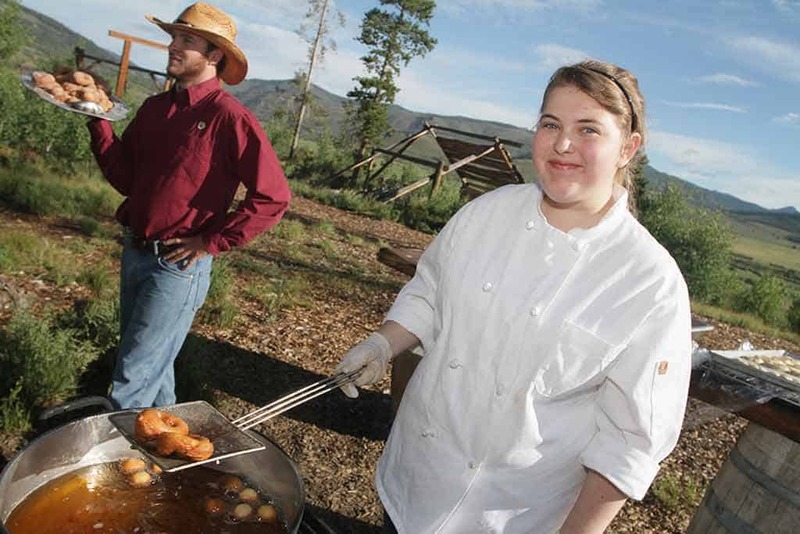 Start your day like a champion at our luxury guest ranch, with delicious food waiting you at every meal, including homemade doughnuts. Coffee made on the fire? Absolutely! 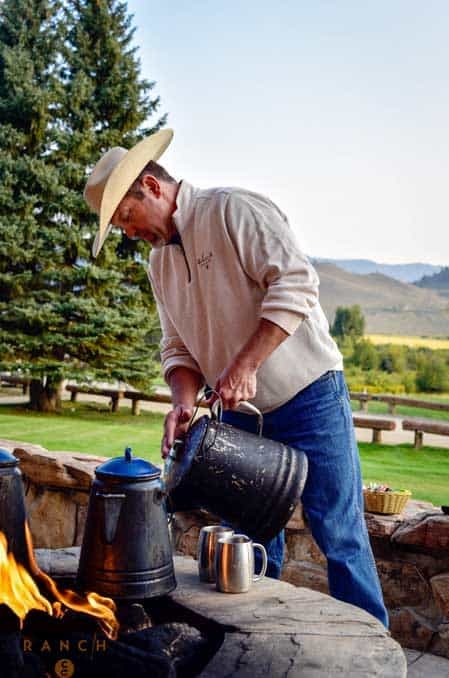 We do it the old fashioned way here at our luxury dude ranch in Colorado. 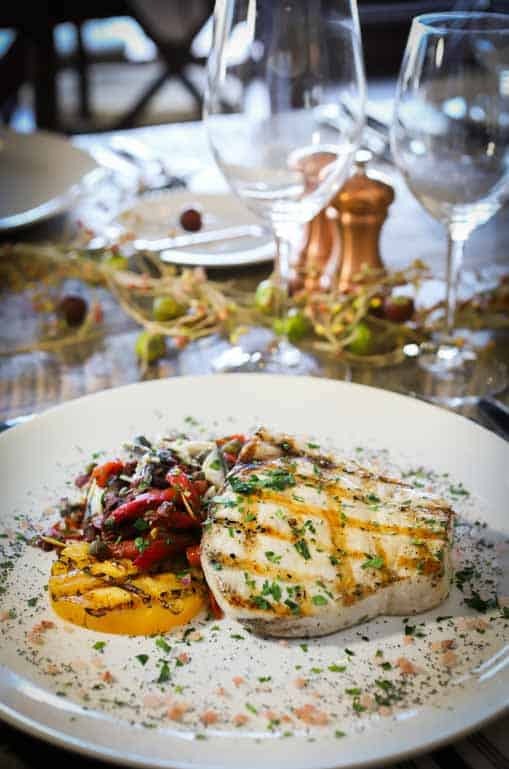 All inclusive ranch vacations at C Lazy U include a variety of meal options, letting your lunch can be as light or as hearty as you wish. 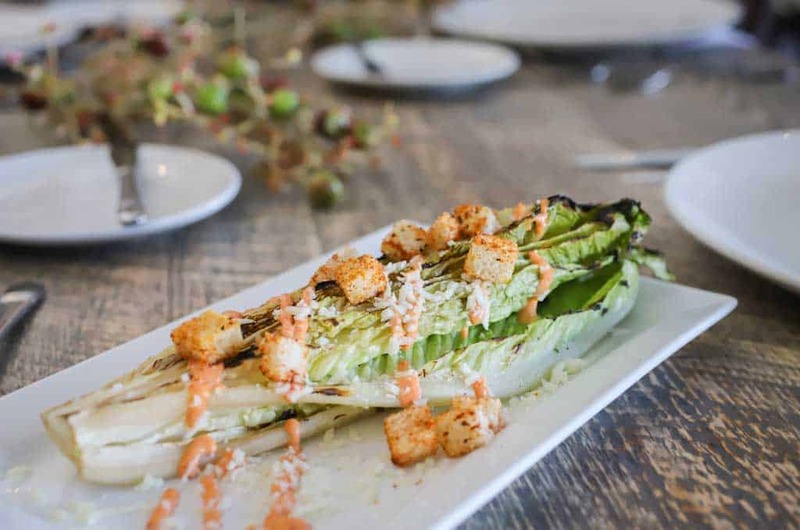 No boring salads here at the ranch! 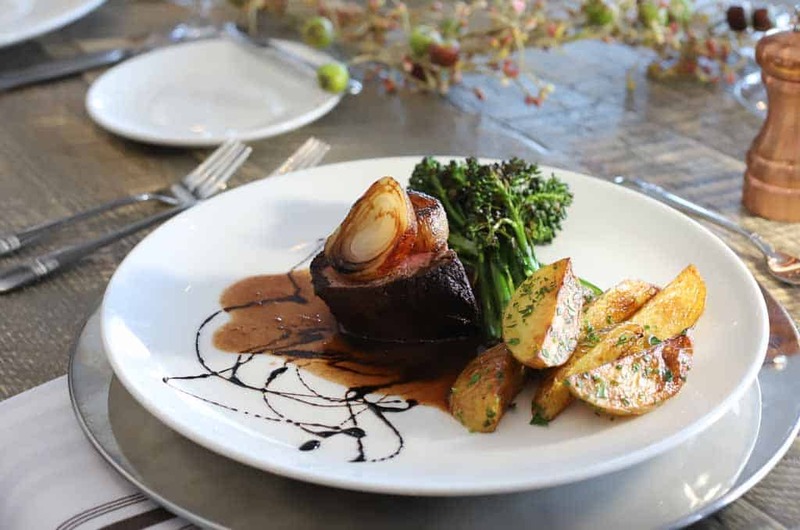 Our chef elevates the simplest of fooda to the most delectable of flavors. 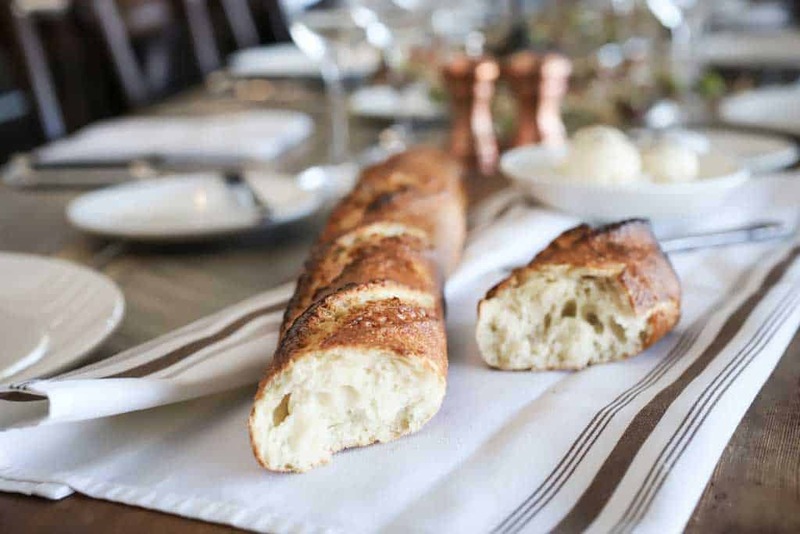 Fresh homemade bread, still warm from the oven, is a special treat that you'll never get tired of! 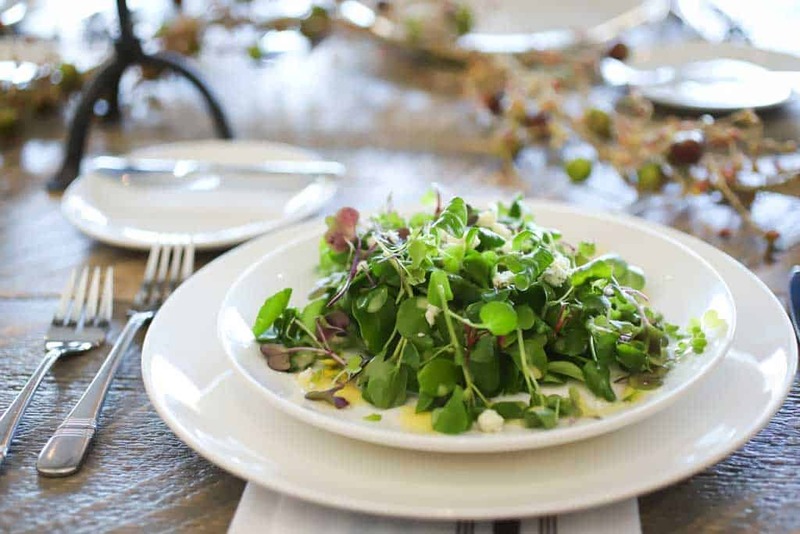 be sure to let us know if you have special dietary needs, such as needing to avoid gluten. Hey, your ribs are showing! In the summer vacation months, we cook out at least twice a week as part of your all-inclusive vacation. But don't think we only know how to barbeque food! 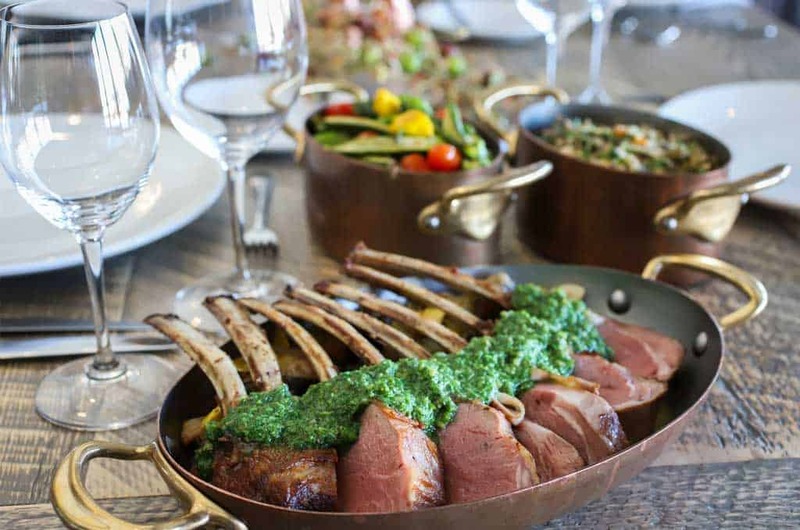 Gourmet meals await you during your luxury dude ranch stay. 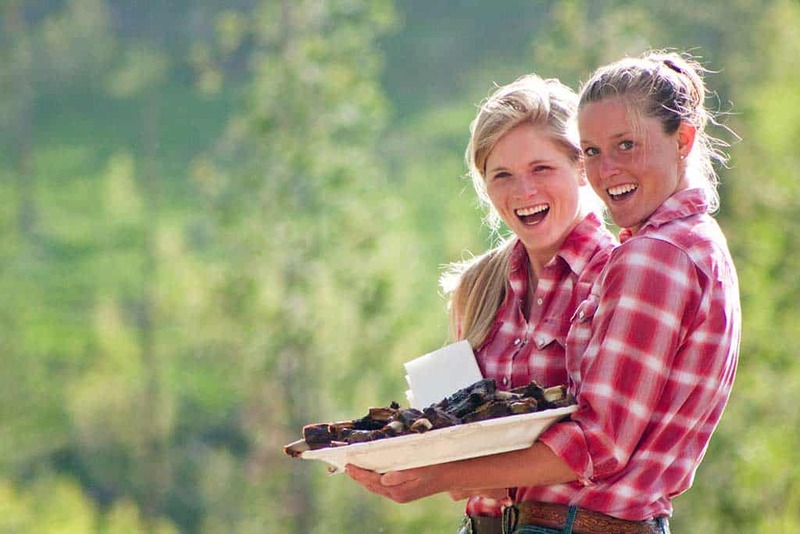 Our chef's inspirations taste all the better for having spent the day in the great outdoors of the Colorado Rocky Mountains. Pork chops cooked expertly on the grill are just one of the lunch and dinner entree options at our all-inclusive dude ranch. 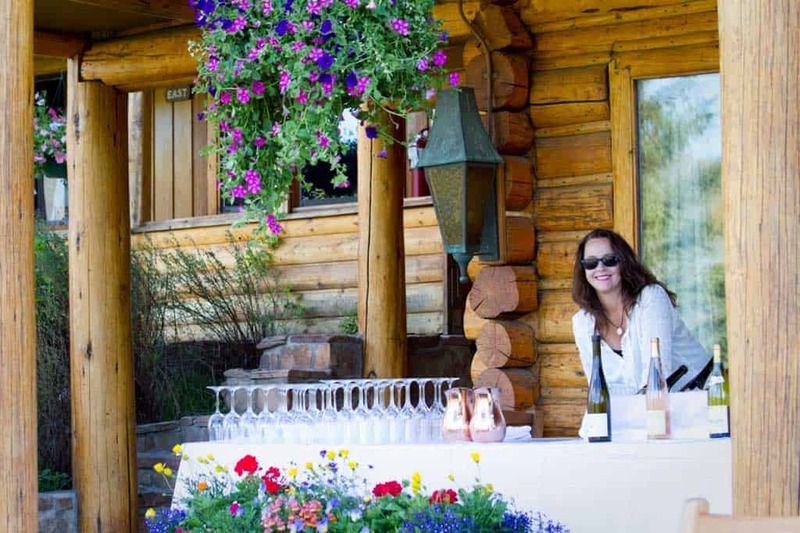 Satisfy your thirst with our top shelf wines, liquors, and beers on tap - a great way to unwind after a day at the Colorado guest ranch. 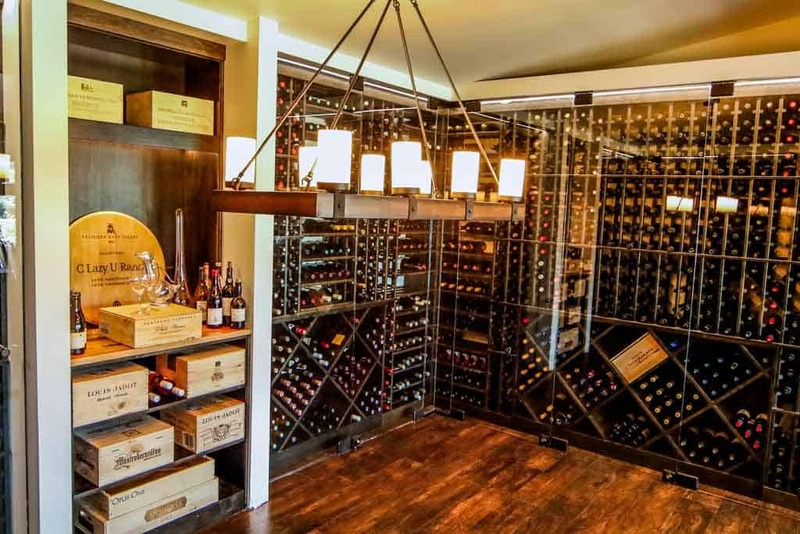 Our new Adega Wine Room is an important part of our award-winning Wine Service. 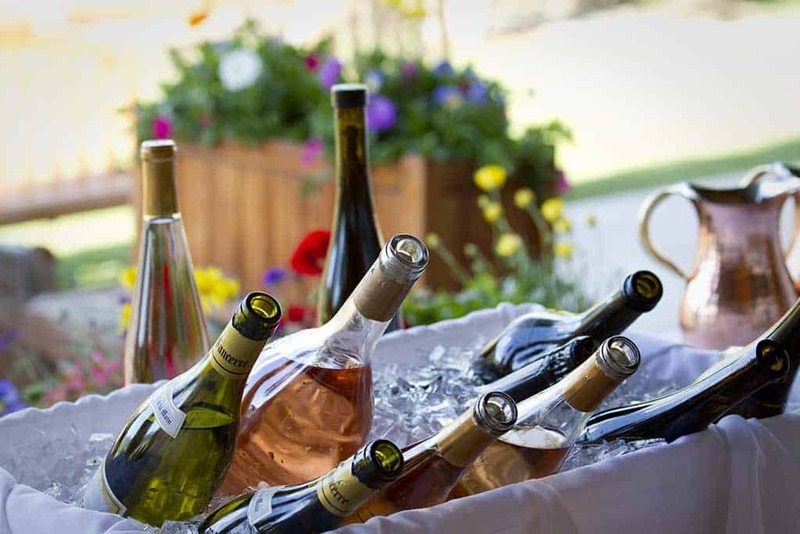 To participate in a wine tasting with our sommelier is to enjoy a history lesson and a gastronomic experience that is truly unique! 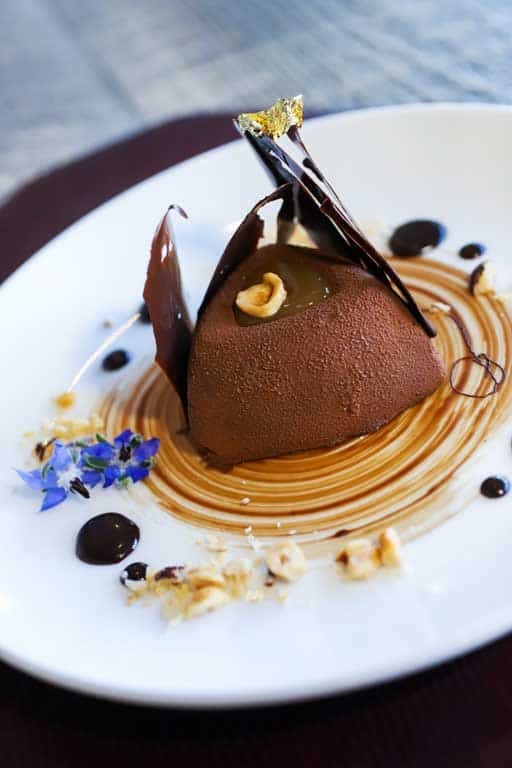 Gourmet snacks and desserts are guilt-free after a day in the saddle. 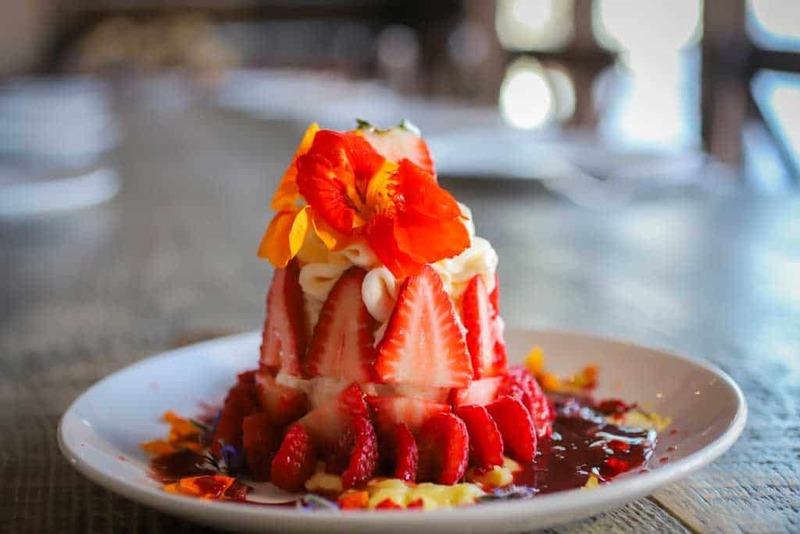 The amazing desserts from our talented chef are a guest favorite while enjoying a luxurious guest ranch vacation. 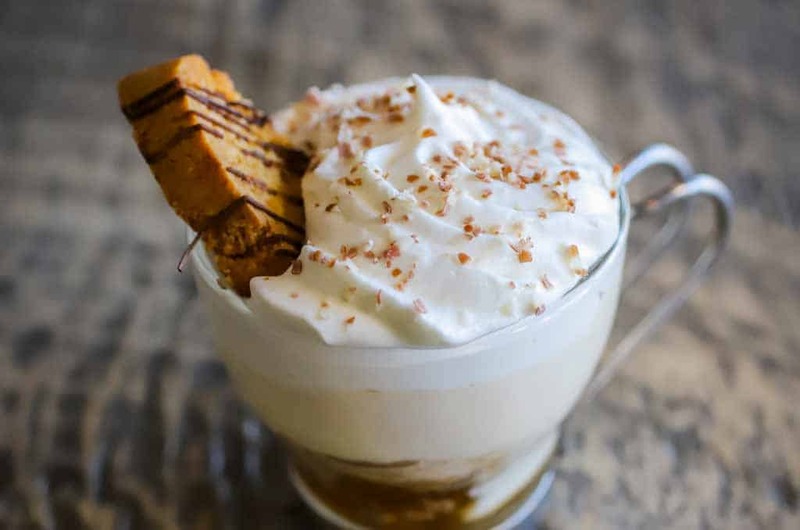 Finish off your gourmet meal with a fine cup of cappuccino! Fabulous views await your arrival. 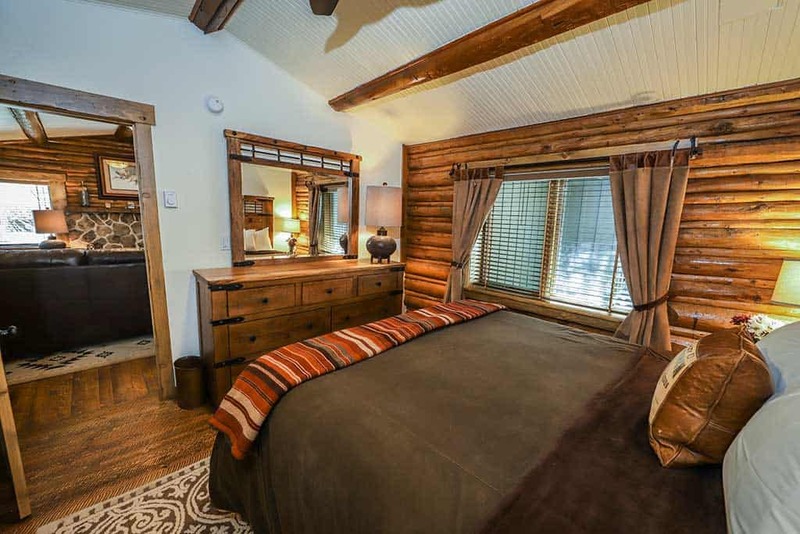 Various bed combinations are available on our guest ranch in Colorado, including king beds, double beds and even bunk beds. Have a large group? No problem. 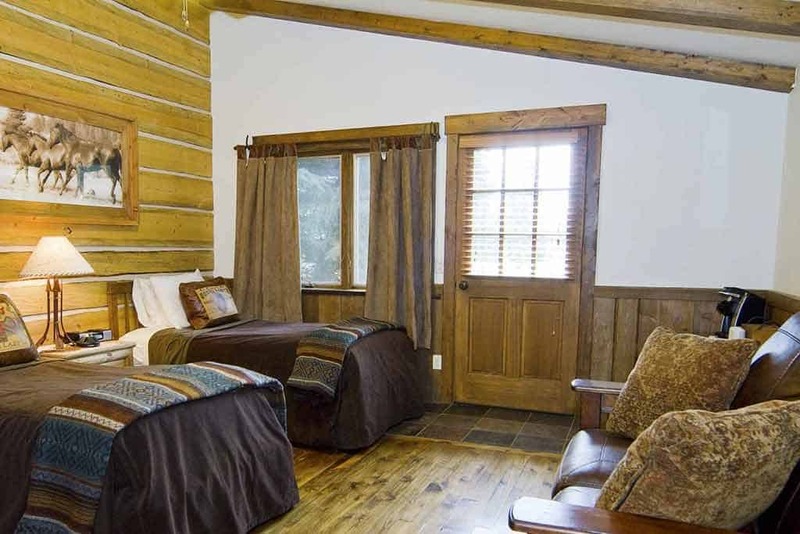 Many cabins connect together so you can all be under one roof. 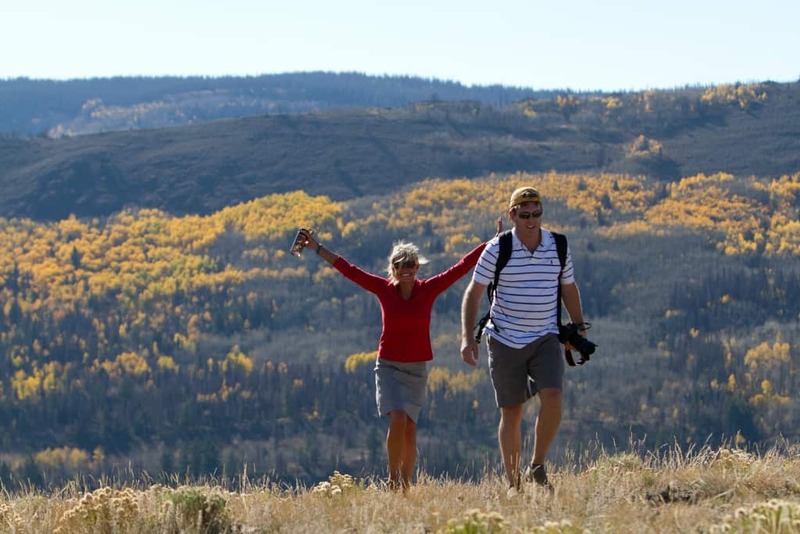 Don't let finding space be an issue on your Colorado vacation! 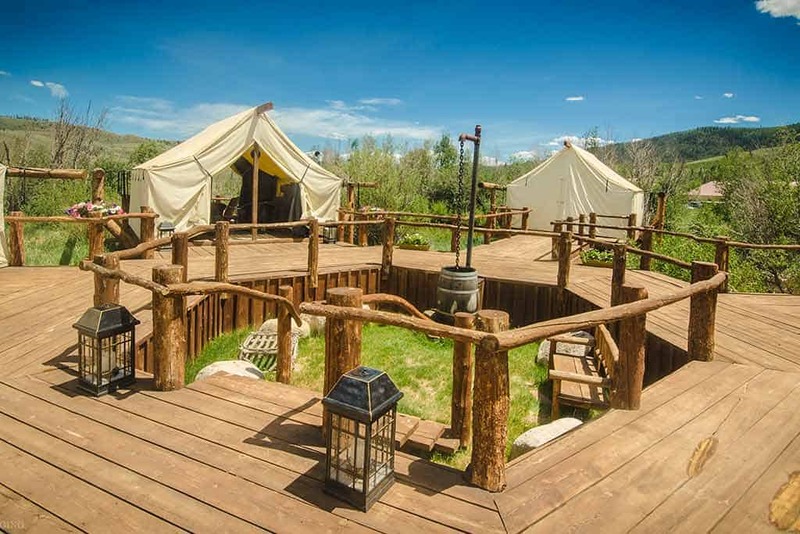 You won't find very many TV's on this family dude ranch while we take the rustic route in Colorado! 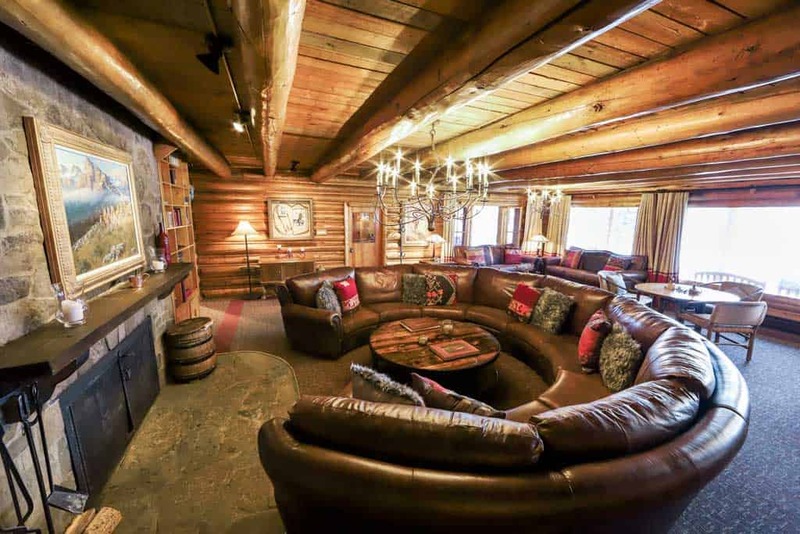 We do have a few in the Midnight Trail Lodge if you need to catch the big game. 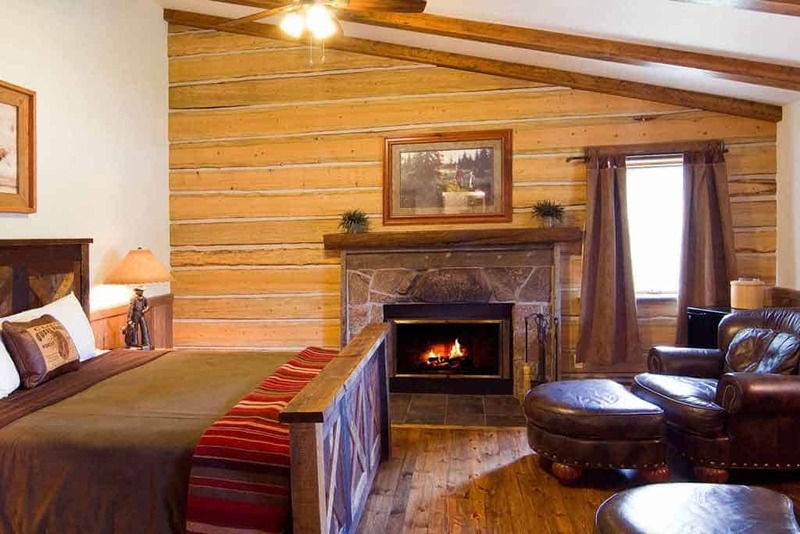 A king bedroom in one of the cabins at the C Lazy U guest ranch in Colorado. 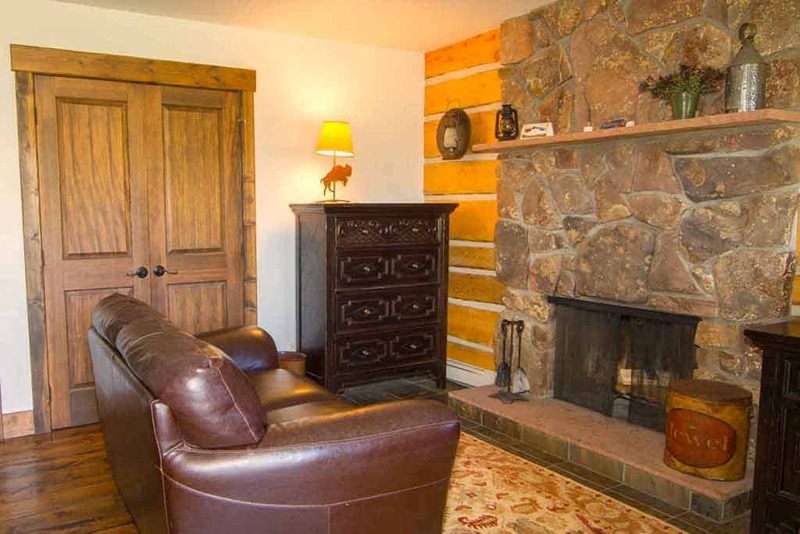 Warm up by the fireplace after a long day on your winter vacation in Colorado. Nearly all of our cabins have one. 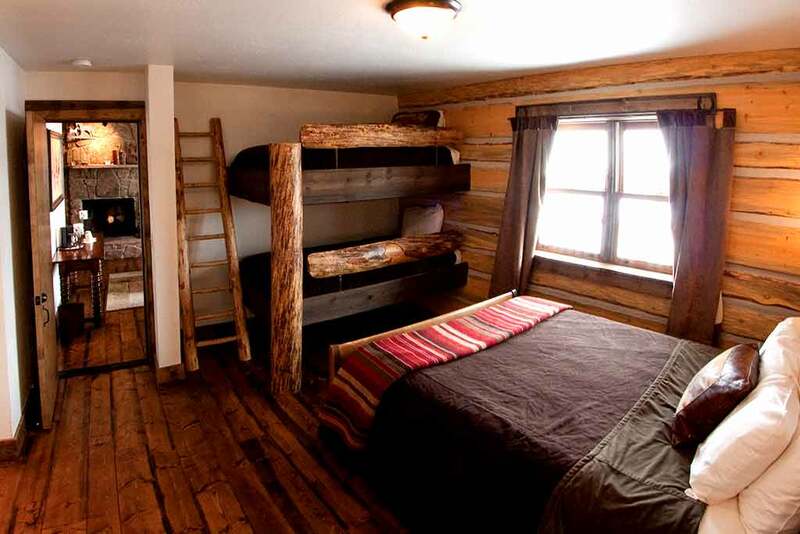 Creative bed combinations, like this one with a double bed and a bunk bed, help fit your whole family in for your Colorado family vacation. 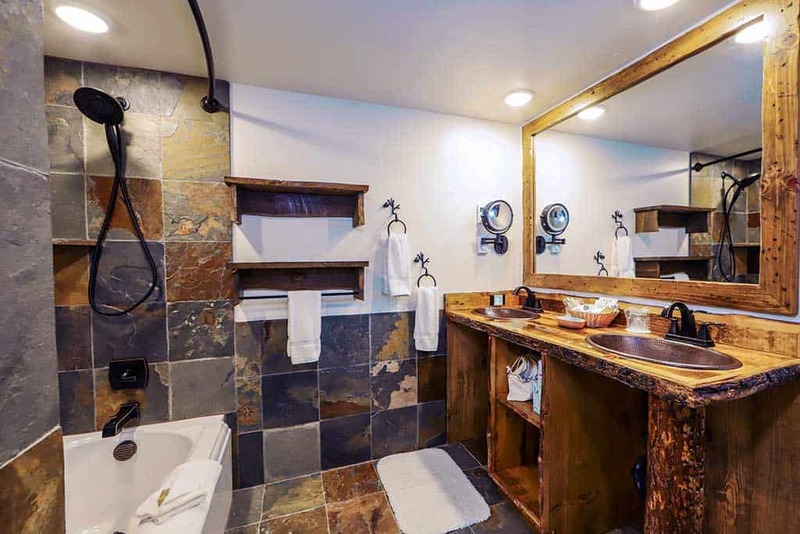 Our luxury cabins are large and comfortably furnished, and have stylish bathrooms as well, some with jetted tubs and some with large soaking tubs. 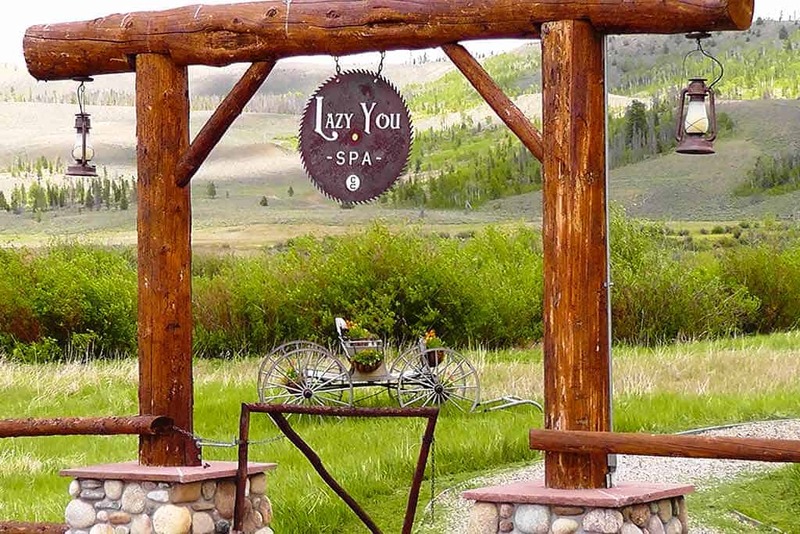 Top off your dude ranch vacation with a treatment at our award-winning Lazy You Spa. 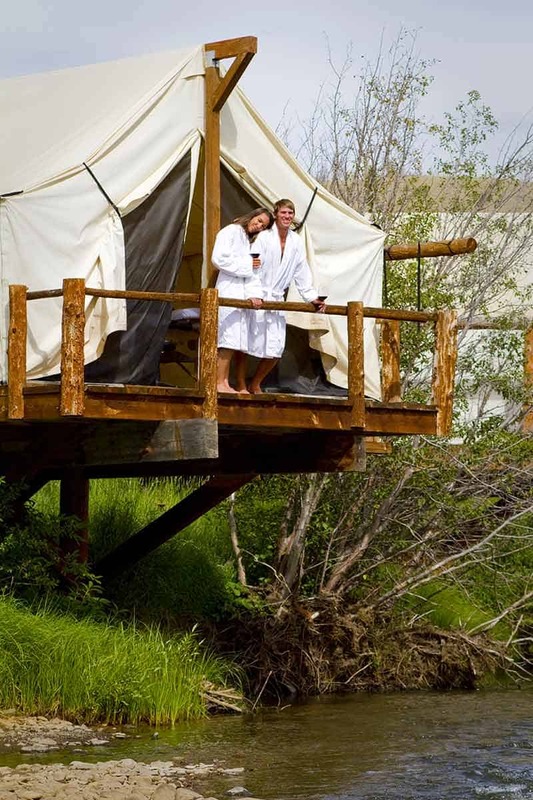 The spa treatment tents are situated in a circle, for privacy and to better display our magnificent scenery. 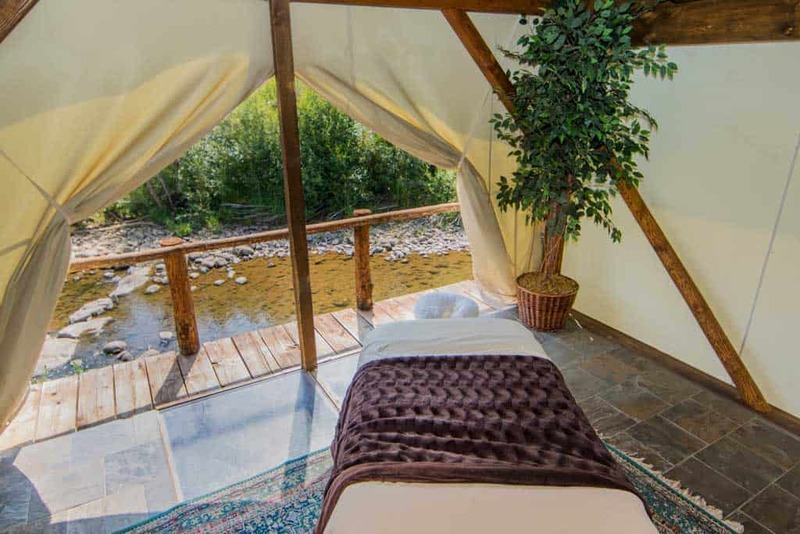 Situated by the river in the Colorado mountains, the "rooms" allow the peaceful sounds of nature to soothe your soul. 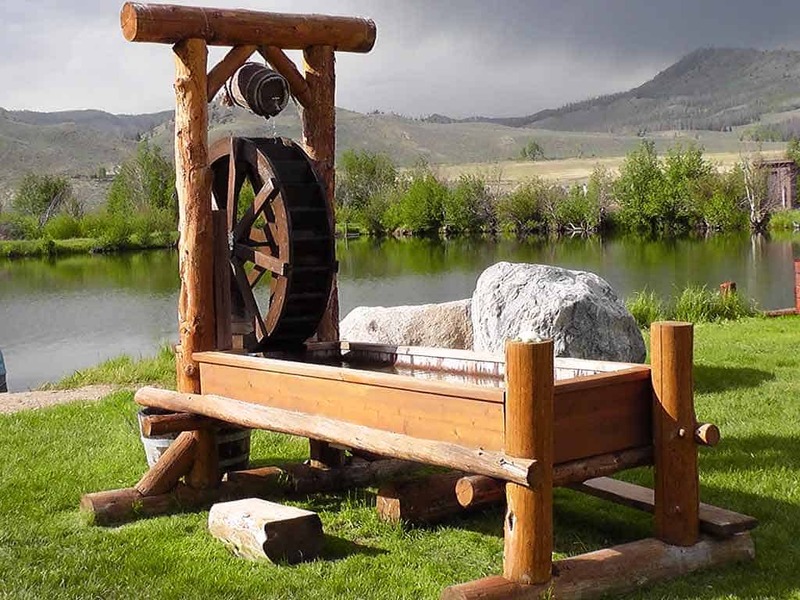 Imagine a tranquil massage by the river as a perfect way to relax on your all-inclusive ranch vacation. 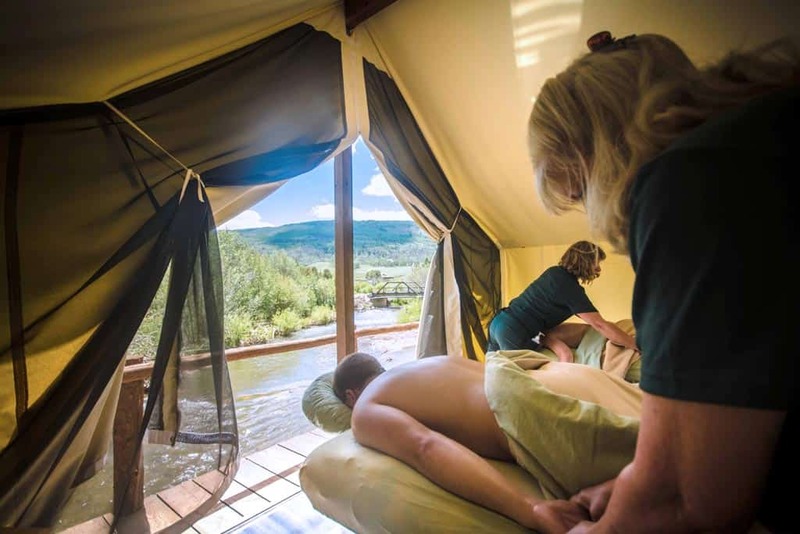 A couples massage is a great way to start your Colorado dude ranch vacation! 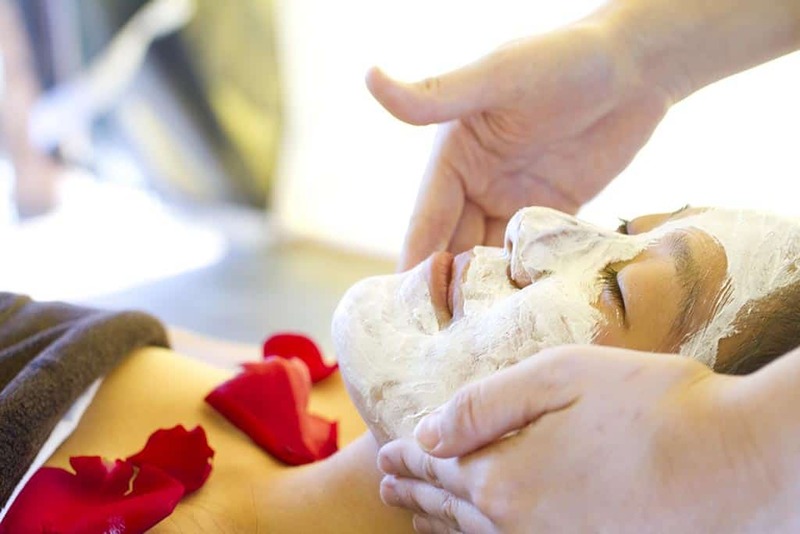 Enjoy our signature facial treatment, which leaves your skin cleansed, brightened and hydrated. 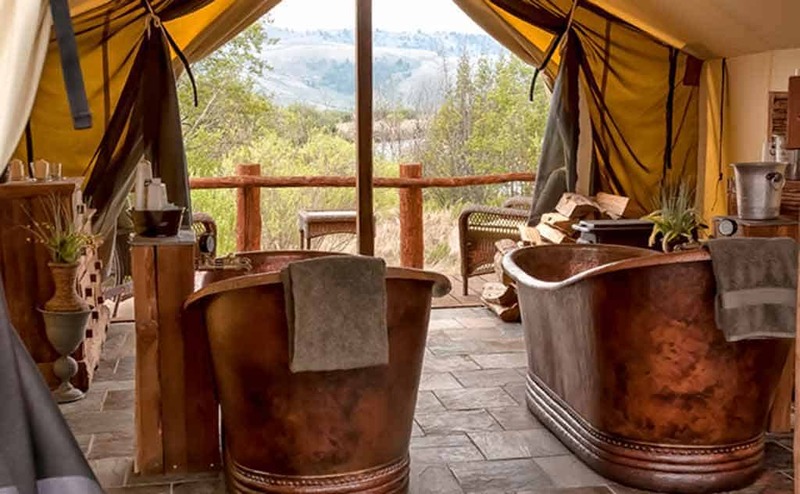 Our famous copper tub soak is especially nice by the moonlight overlooking the Colorado Rocky Mountains. It's a good idea to arrive early and relax in our tranquil lobby for a short time before your appointment. 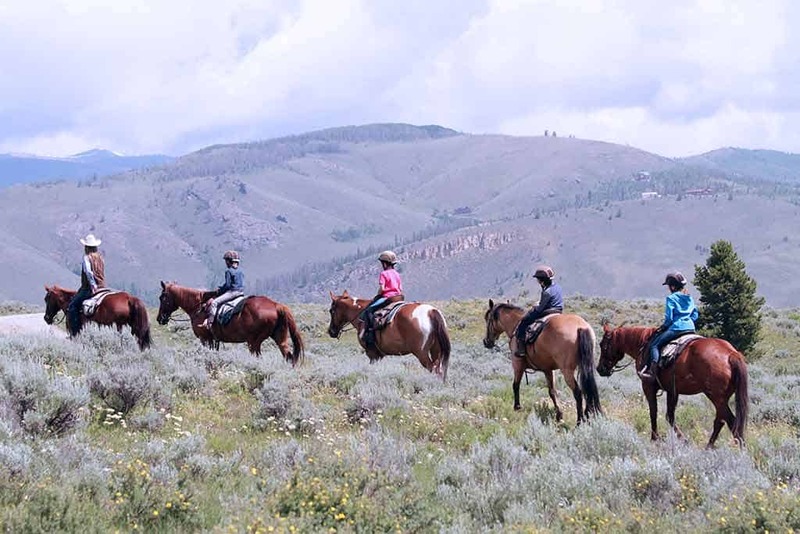 At any time during your spa experience, you might look out and see our beautiful dude ranch horses thundering by. 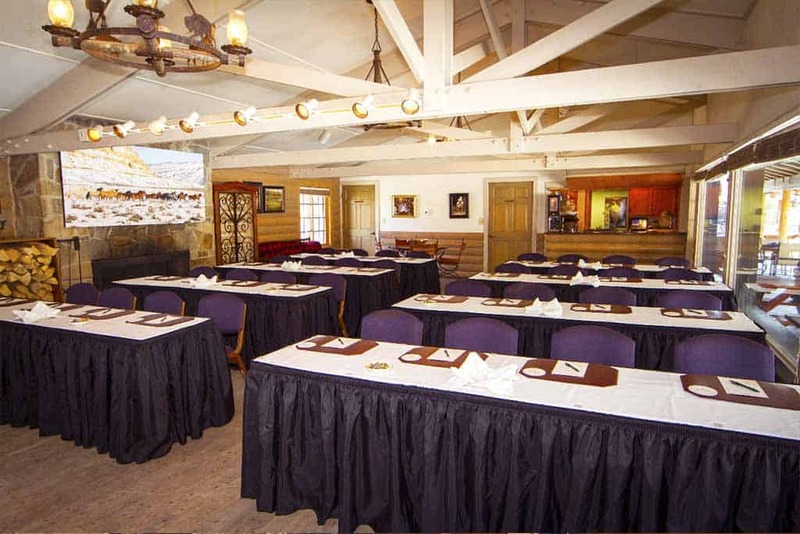 Corporate retreats at the C Lazy U Ranch have plenty of meeting space. 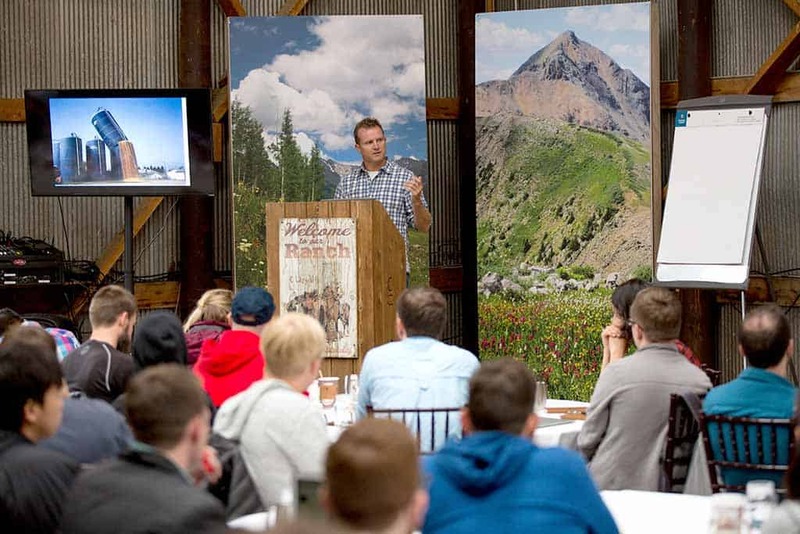 The new Latigo Room offers state of the art audio and visual for your corporate retreats. 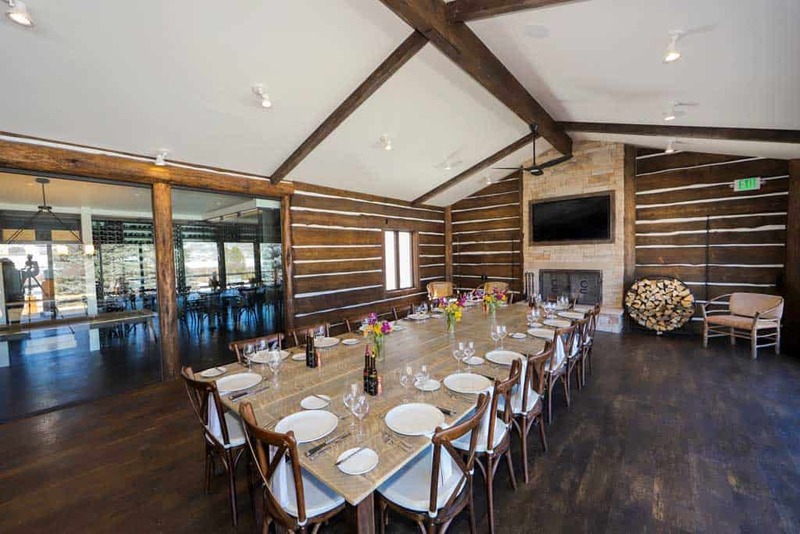 The Latigo Room also can function as a banquet room or private dining room. 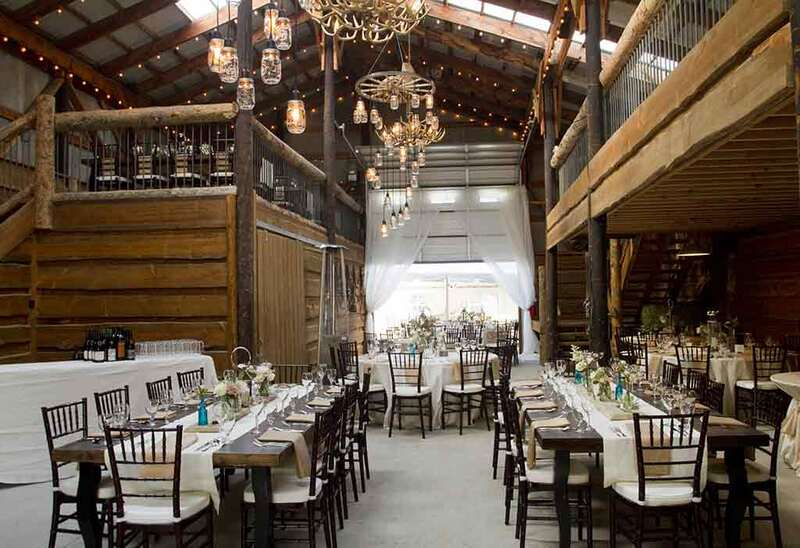 The renovated hay barn is one of our largest - and most elegant - places to host a fancy ranch wedding reception. The acoustics in the hay barn are great for speeches and lectures. Photo courtesy of Viget. 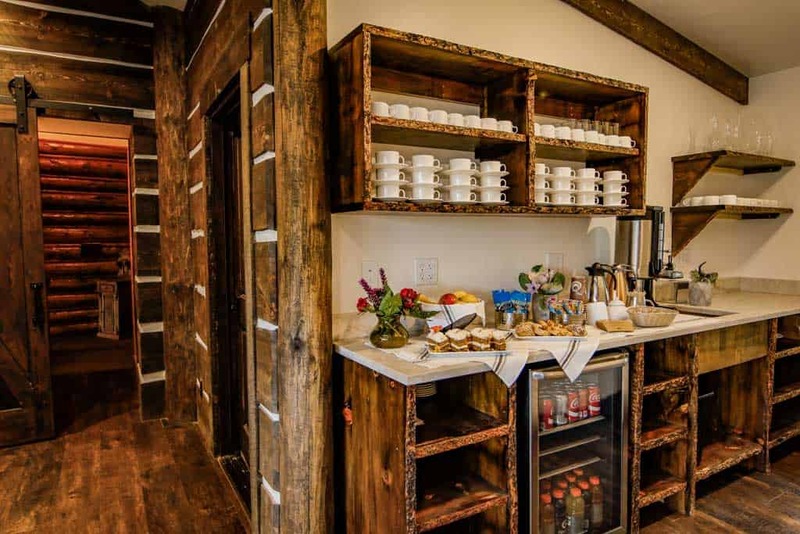 Coffee and snack service for your meeting. 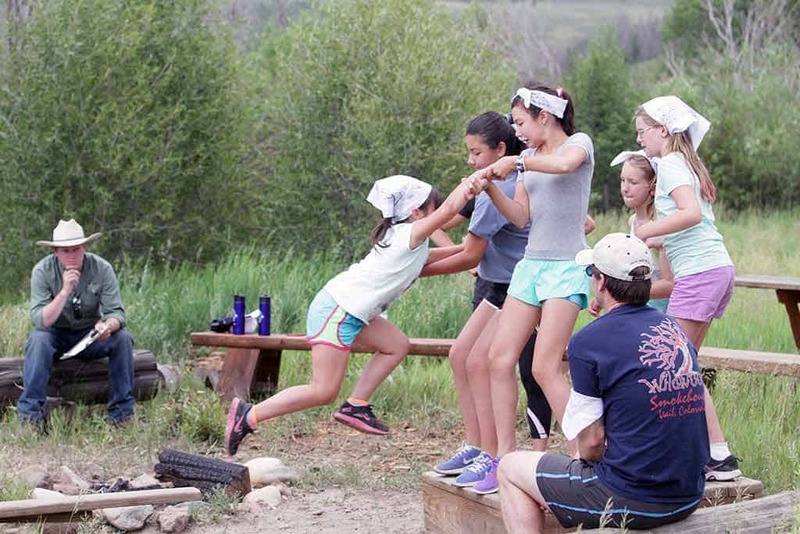 Navigating our ropes course teaches your group to help and trust each other - a perfect executive retreat exercise. 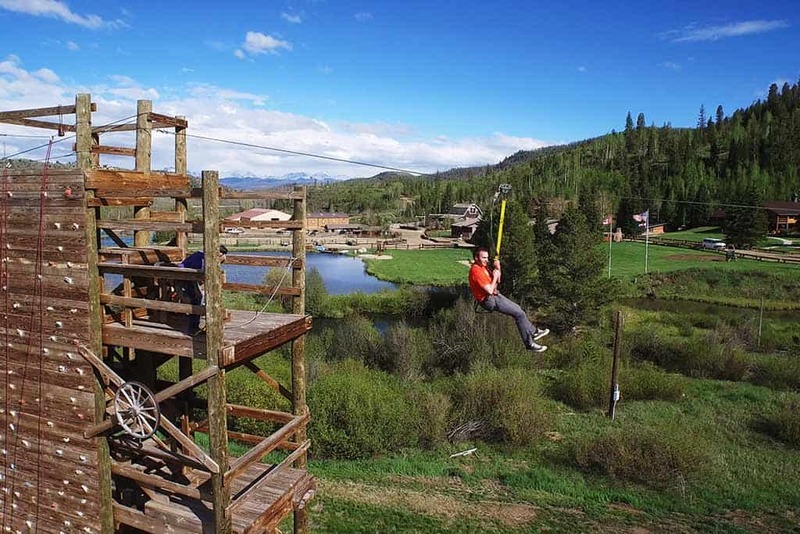 Get a bird's eye view of all the ranch has to offer on our zip line. Photo courtesy of Viget. 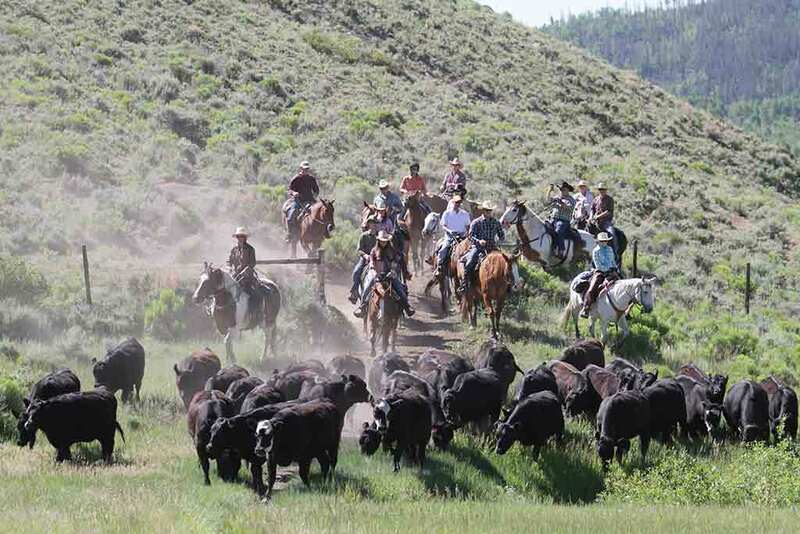 Our cattle drives are a great team building exercise as a part of your company retreat. Come check out our all-inclusive options. 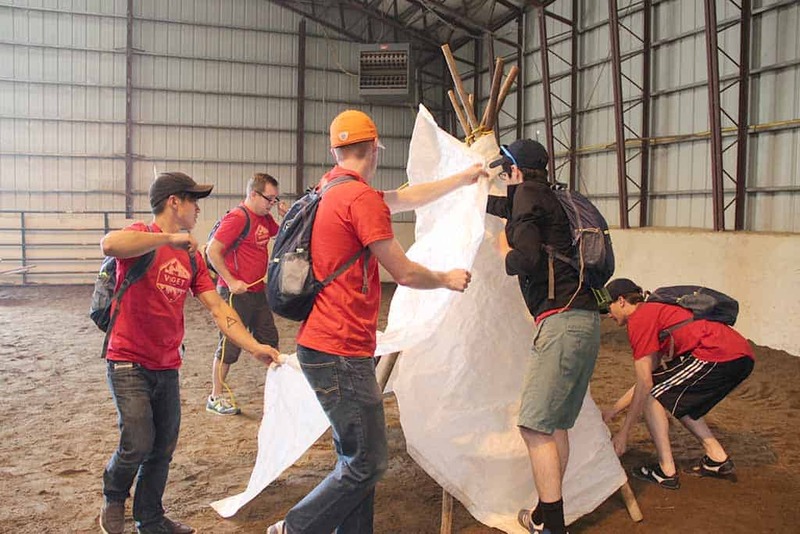 Teepee building is just one of our team-building activities. Photo courtesy of Viget. 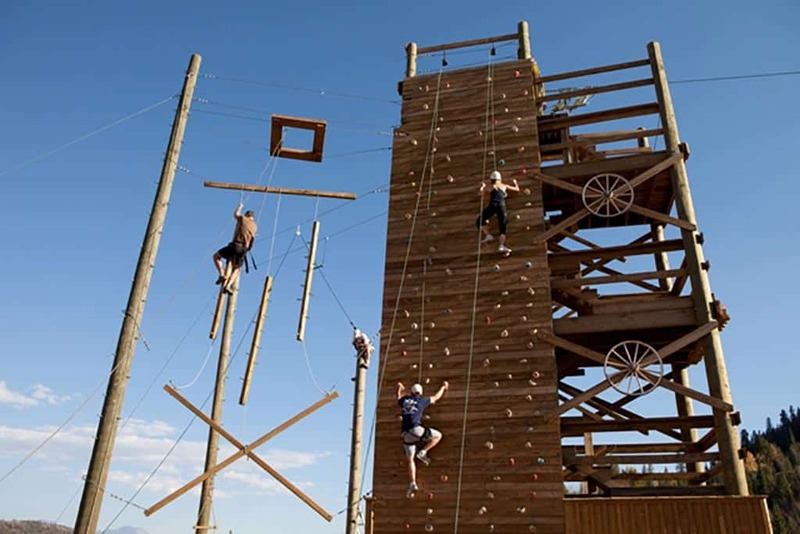 You'll feel like a winner after a corporate retreat at the C Lazy U Ranch. You'll find lots of great photo opportunities at a C Lazy U Family Reunion. Cousins will bond during the multitude of activities on the ranch. Families who ride together, stay together. 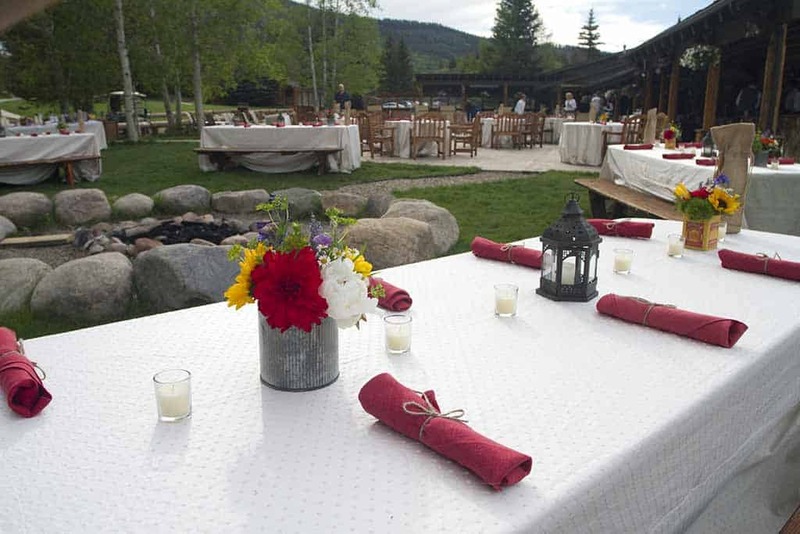 Welcome your group with a pretty (and delicious) luncheon - a great way to kick off your Colorado guest ranch vacation. Get your dance at our dude ranch. 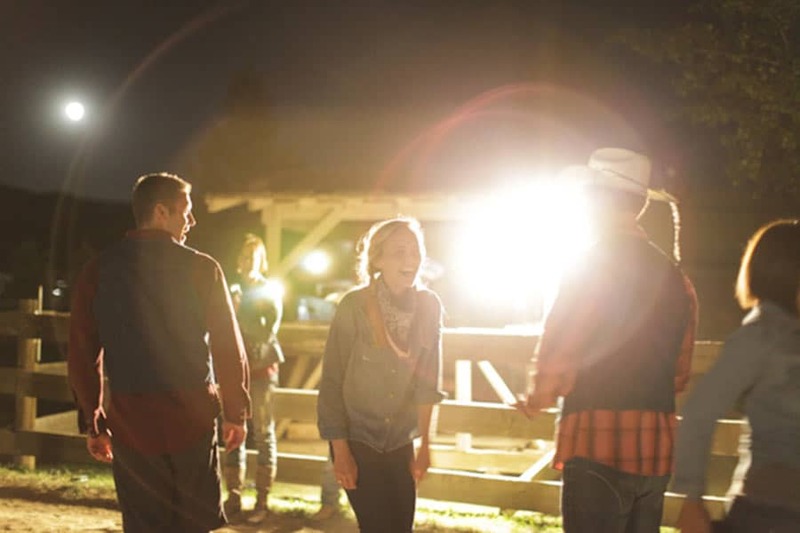 Enjoy an old-fashioned hoe-down with live music and and bust a move in your cowboy boots. 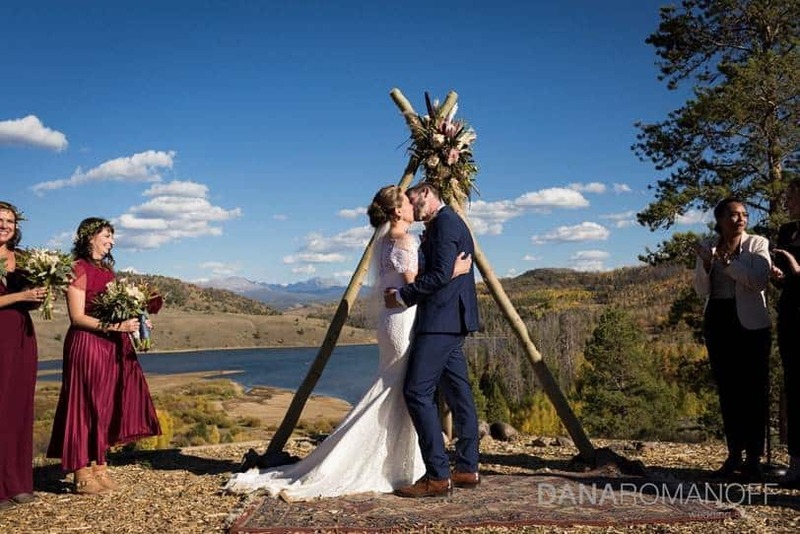 We have some of the prettiest scenery and photo backdrops for your Colorado outdoor wedding! 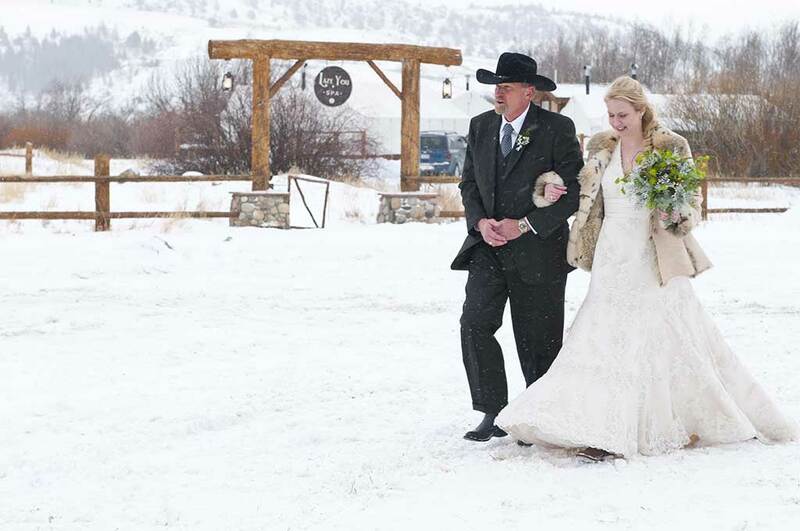 Set your wedding location anywhere on the ranch that you want. 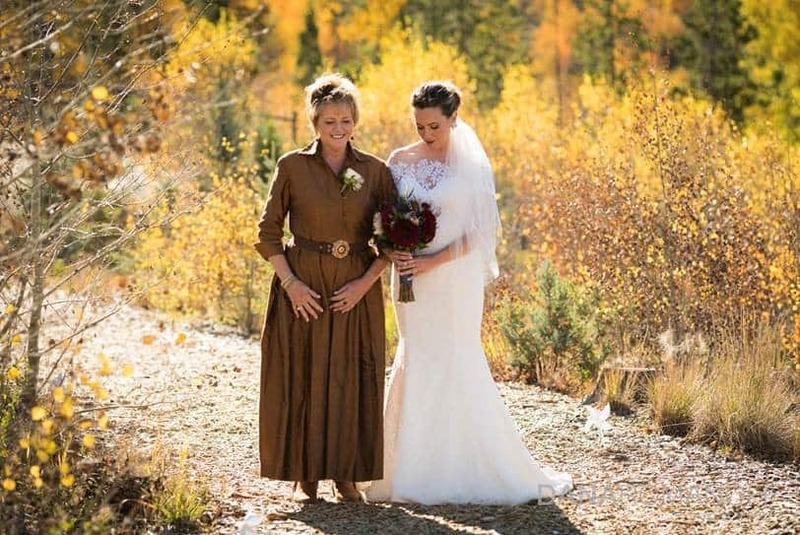 Gorgeous Fall scenery can be all you need for decoration! A perfect spot for that First Kiss. The wedding is over, now let the fun begin! 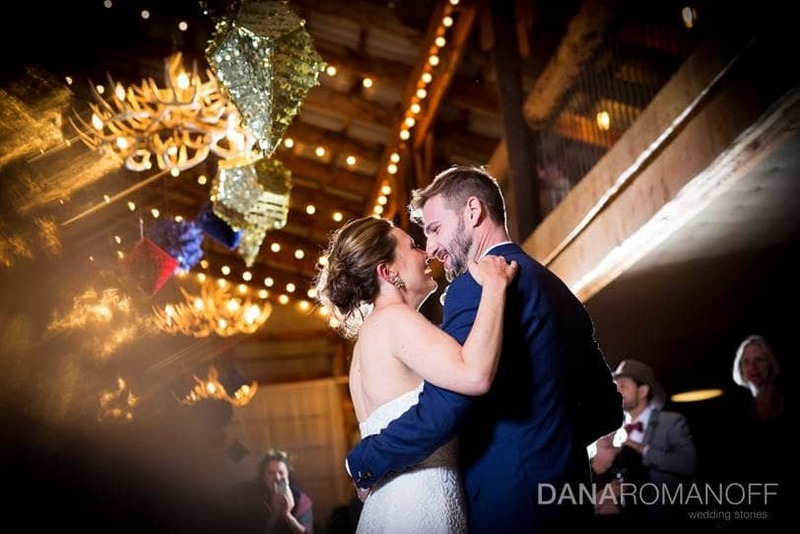 Our Hay Barn can hold a LOT of your friends and family to help you celebrate. 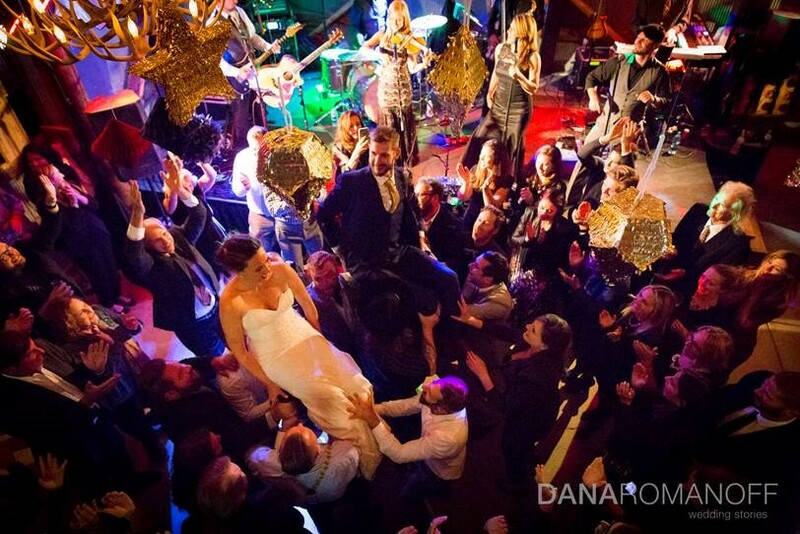 Dance the night away on your first night as a married couple. 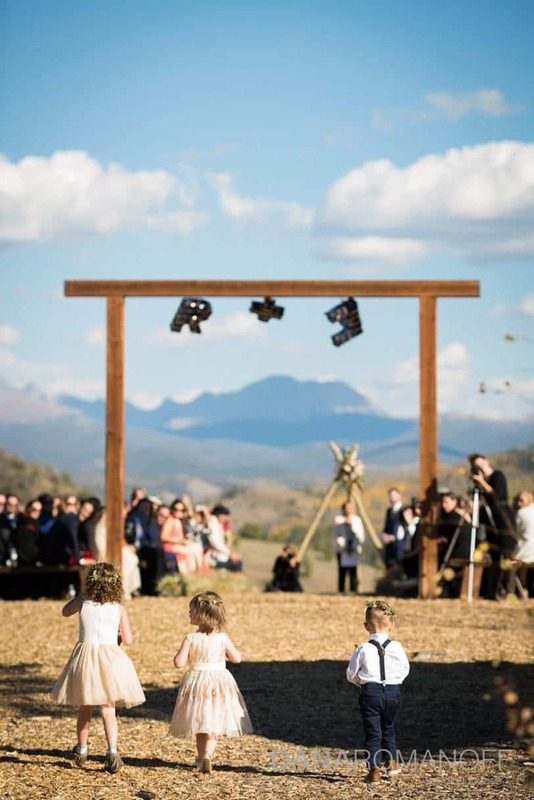 Make your wedding an outdoor ranch wedding. 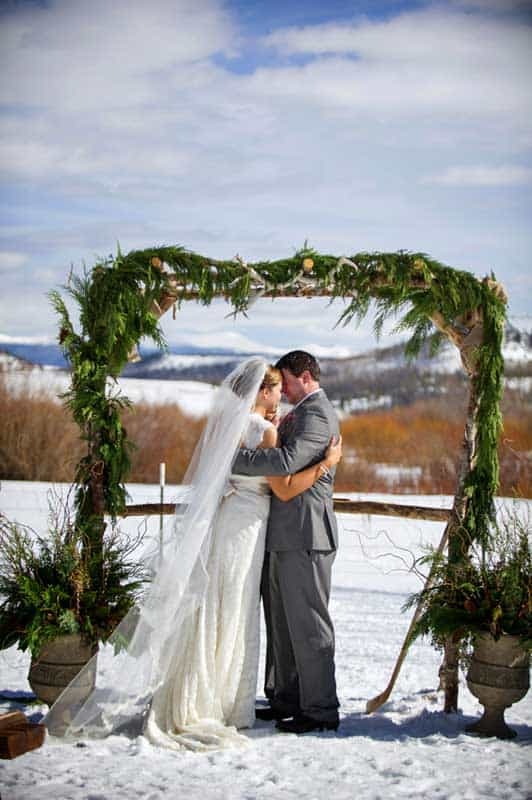 Colorado's mild temperatures and abundance of snow ensure your winter wedding will be perfect. 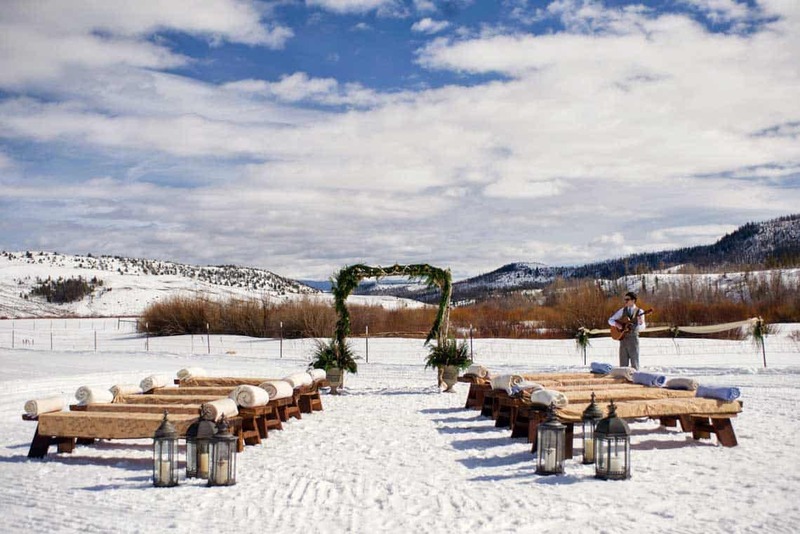 An outdoor winter wedding? Yes! In Colorado it's very possible, and very pretty too! 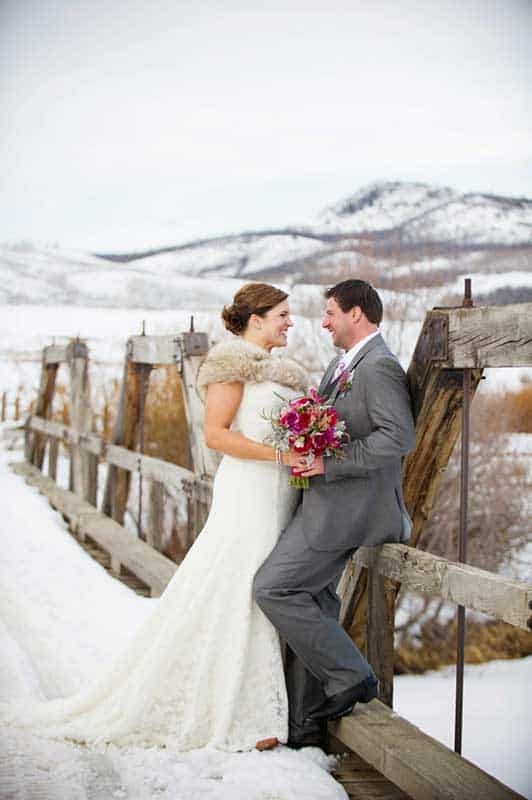 You find fantastic photo opportunities for your wedding photos, even in winter. It's time to kiss the bride! 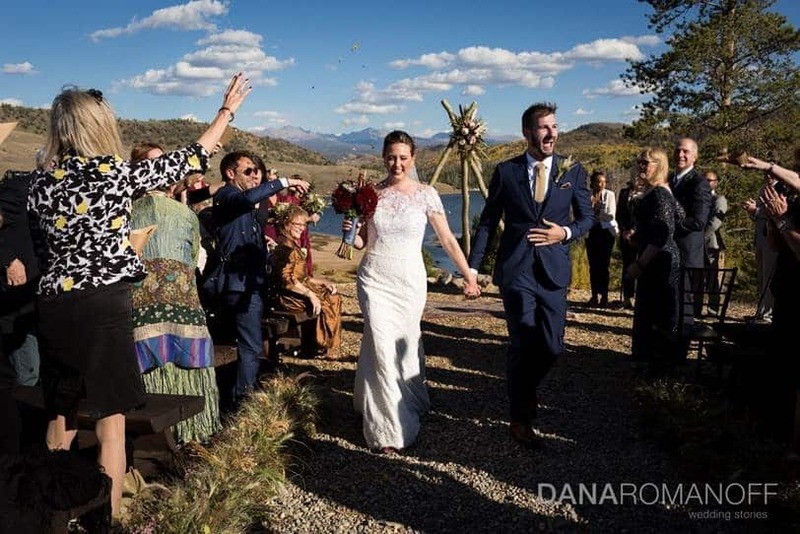 I recently stayed at C Lazy U Ranch for a friend's wedding. This place is well taken care of, the land is pristine and the location is just gorgeous. 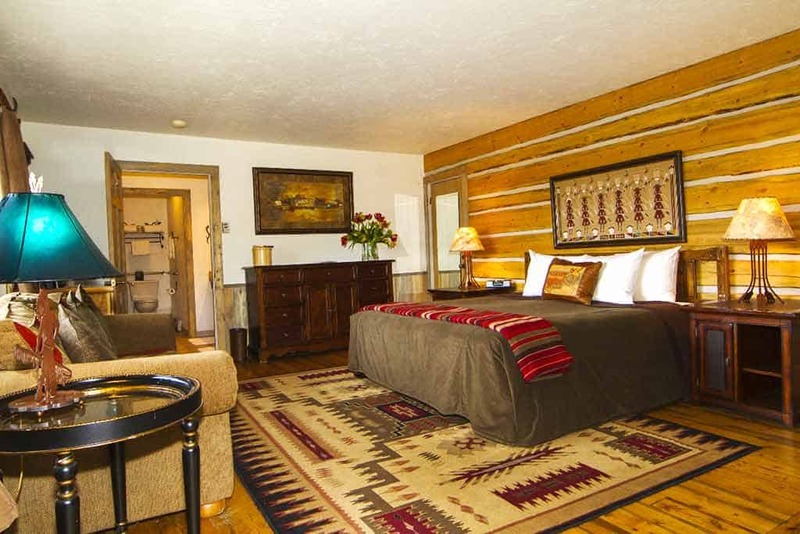 The cabin-style rooms are really nice. Ours had a wood burning fire place and a Keurig coffee machine (I'm a bit of a coffee fanatic). The bed was SO comfortable and had thick blankets that kept me warm throughout the night.